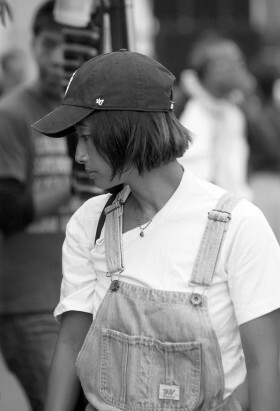 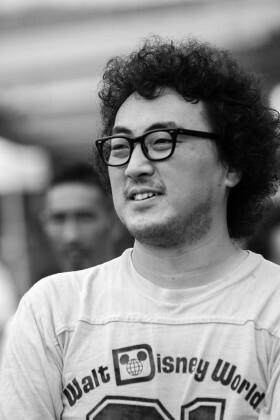 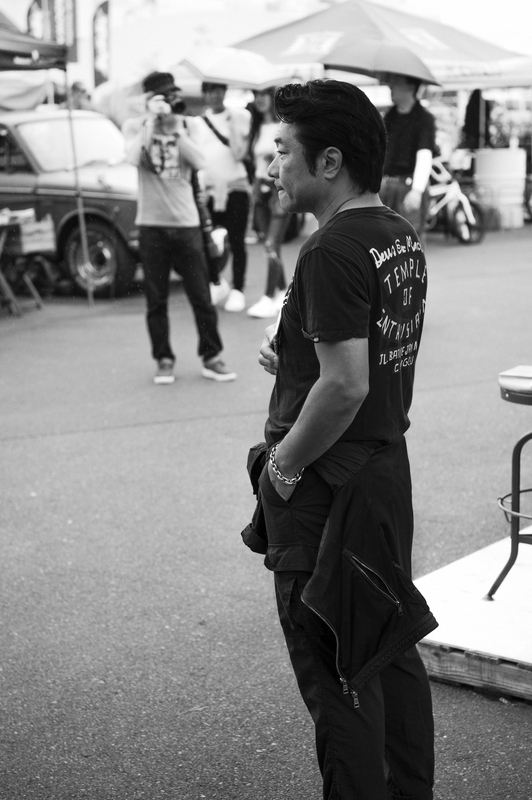 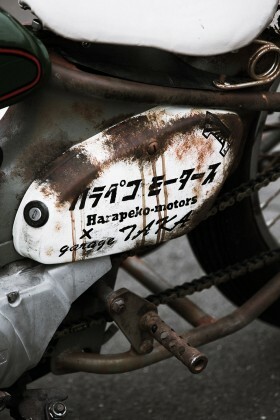 They had toiled for months, secreted away in dimly lit workshops buried deep within the Tokyo Metropolis and beyond. 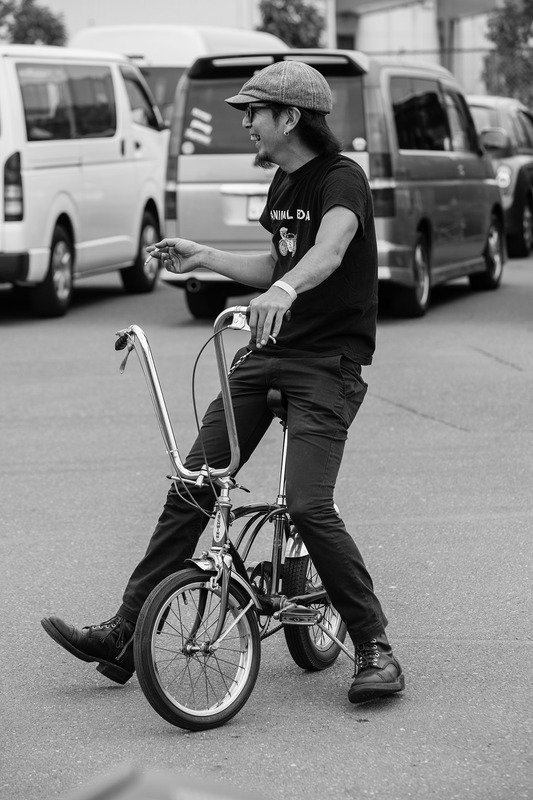 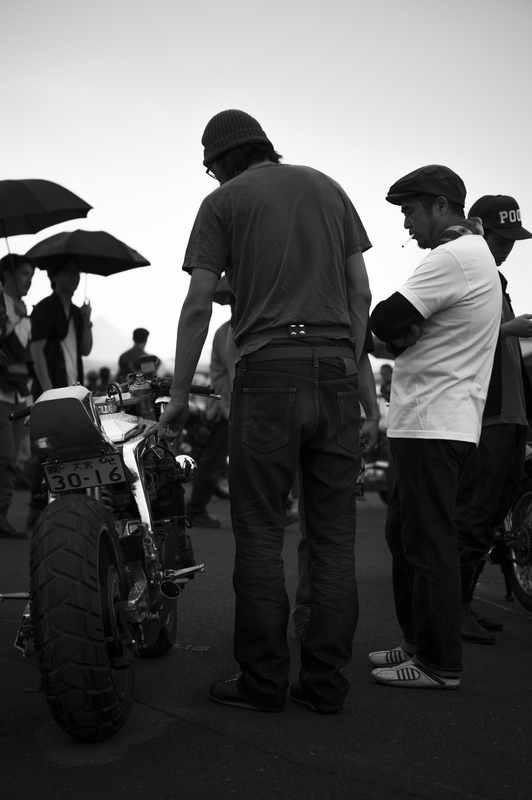 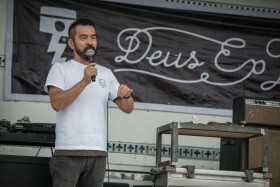 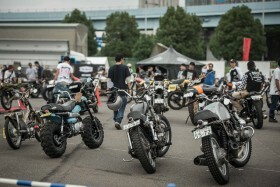 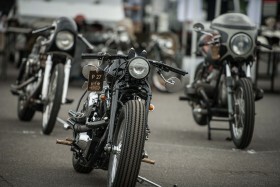 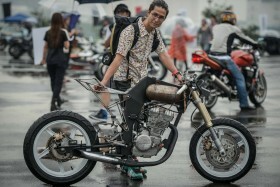 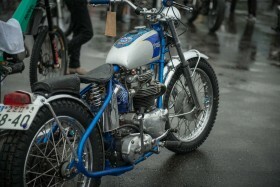 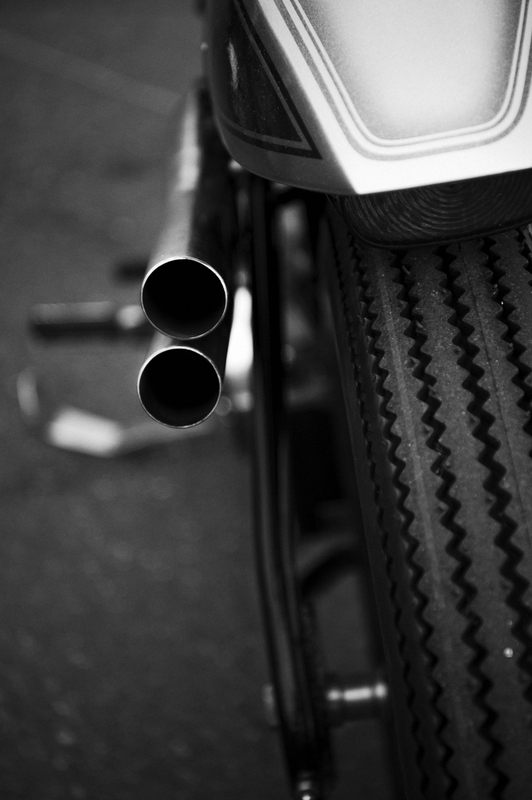 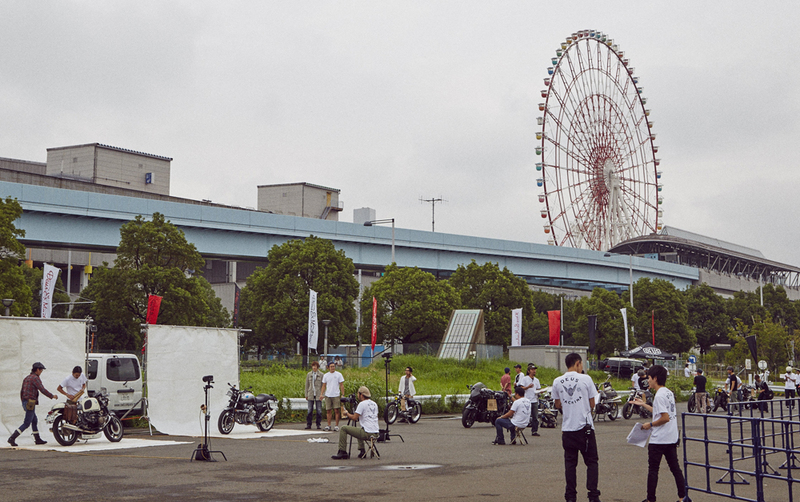 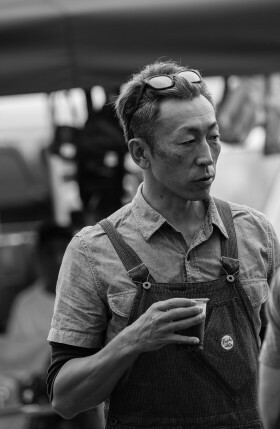 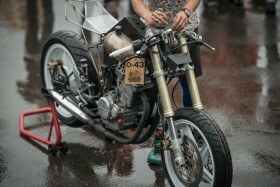 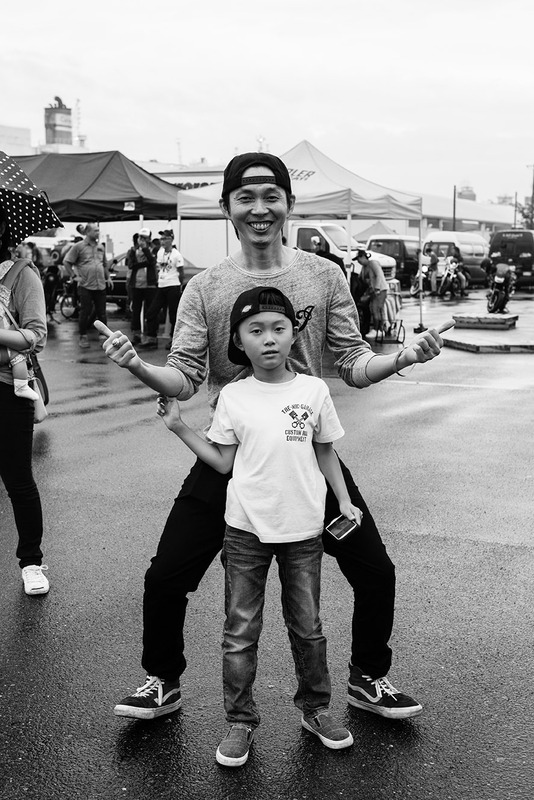 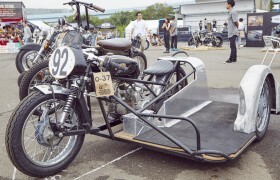 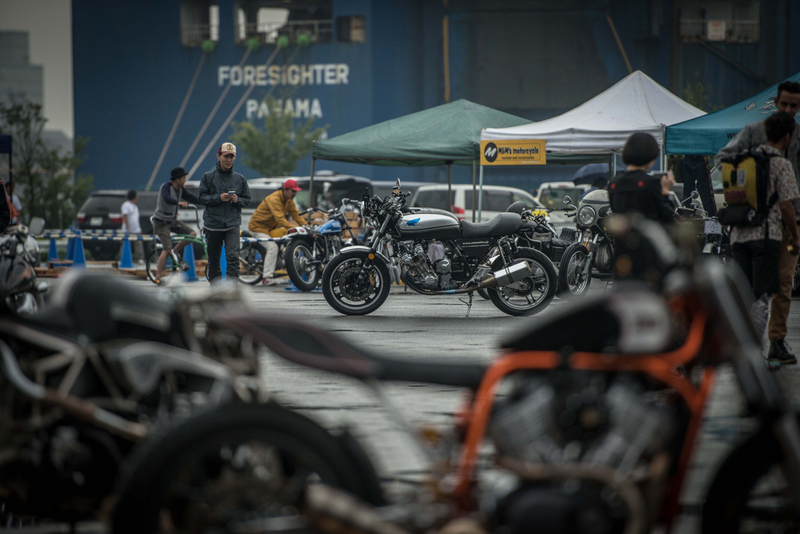 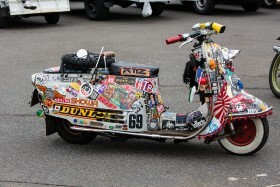 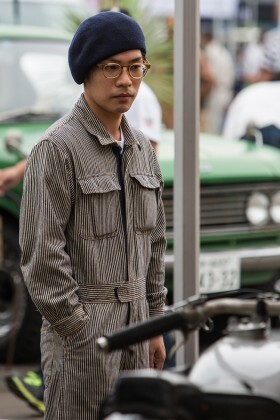 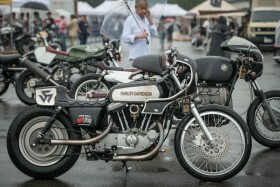 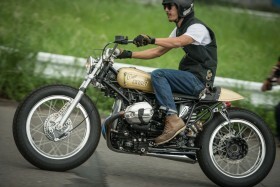 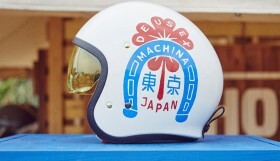 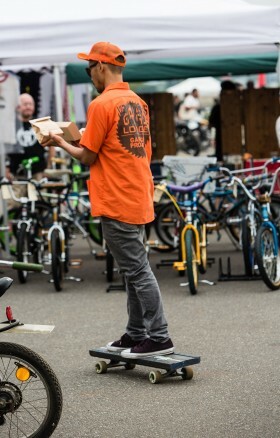 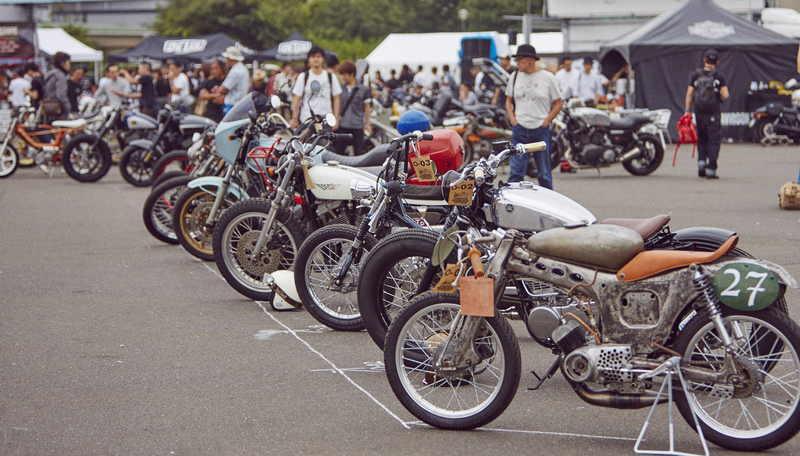 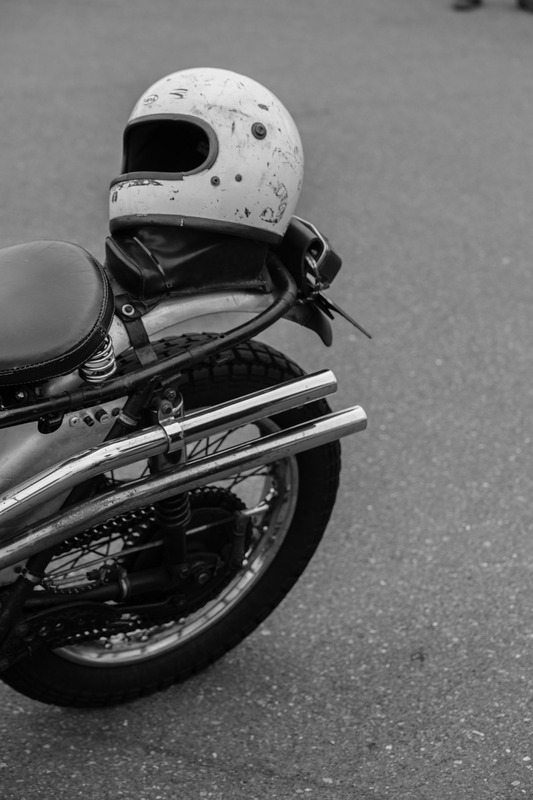 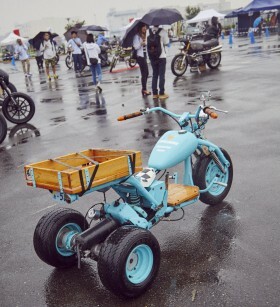 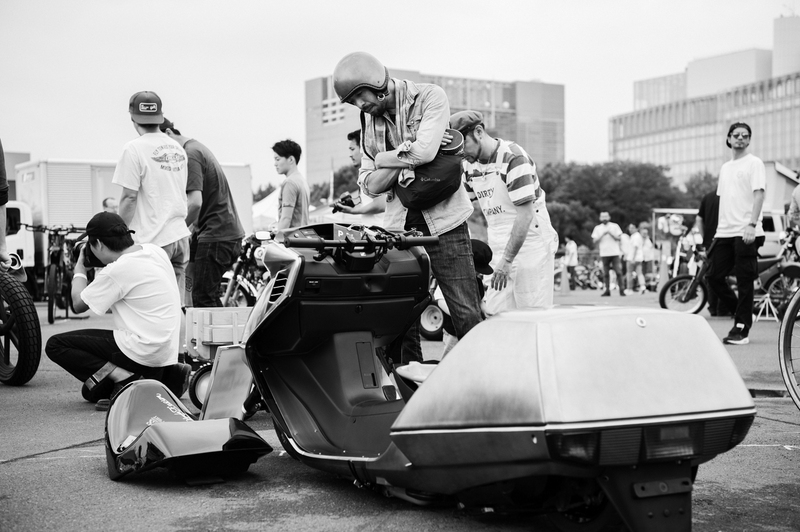 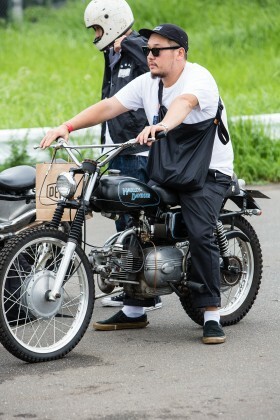 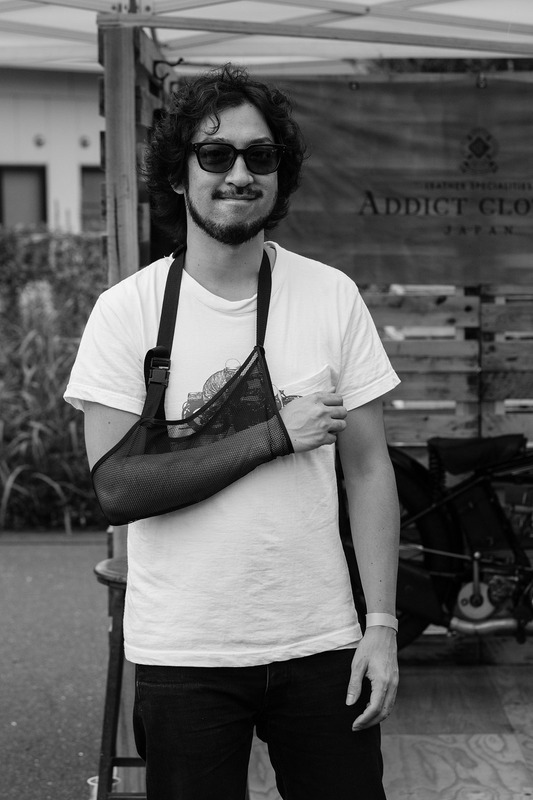 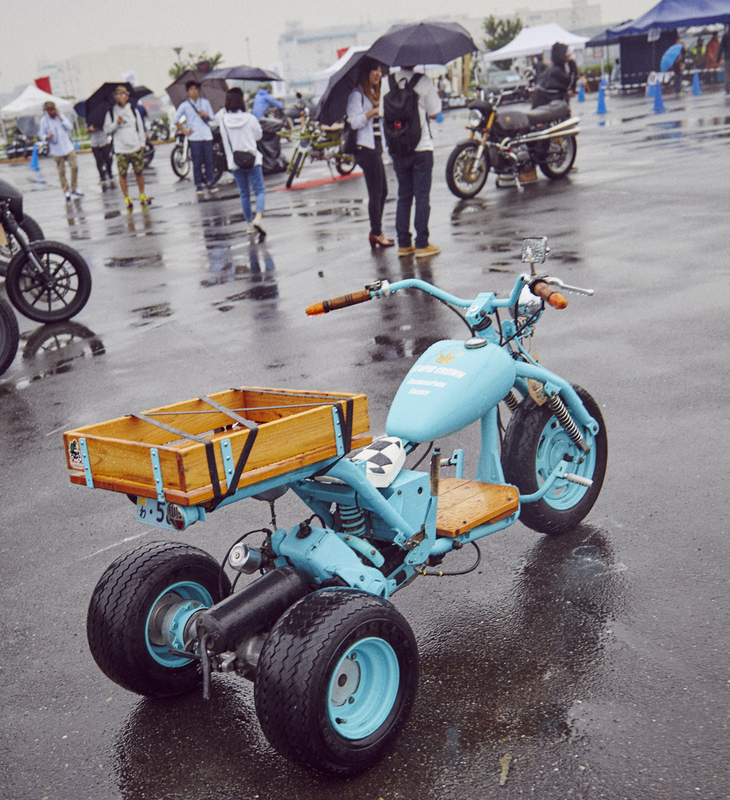 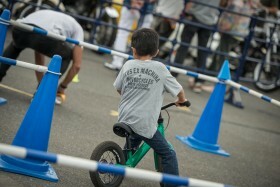 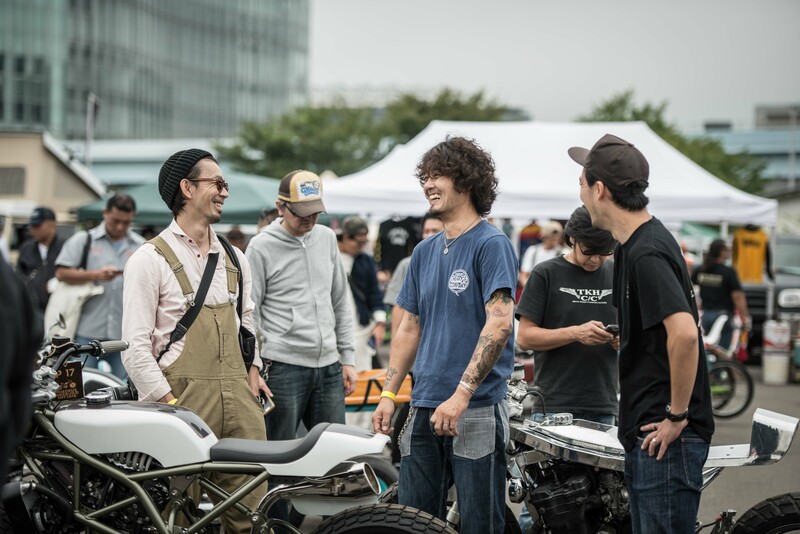 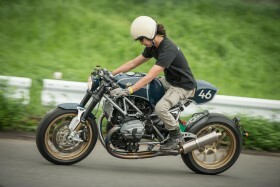 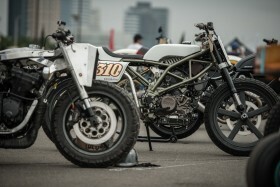 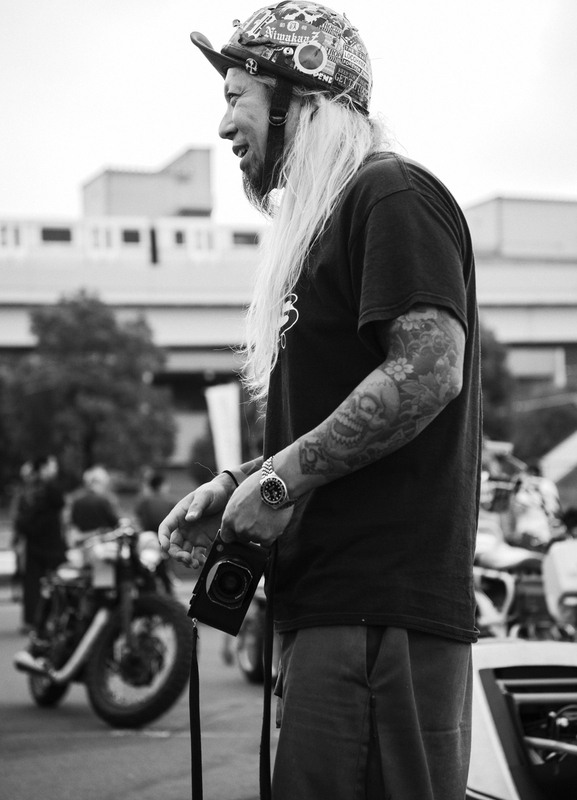 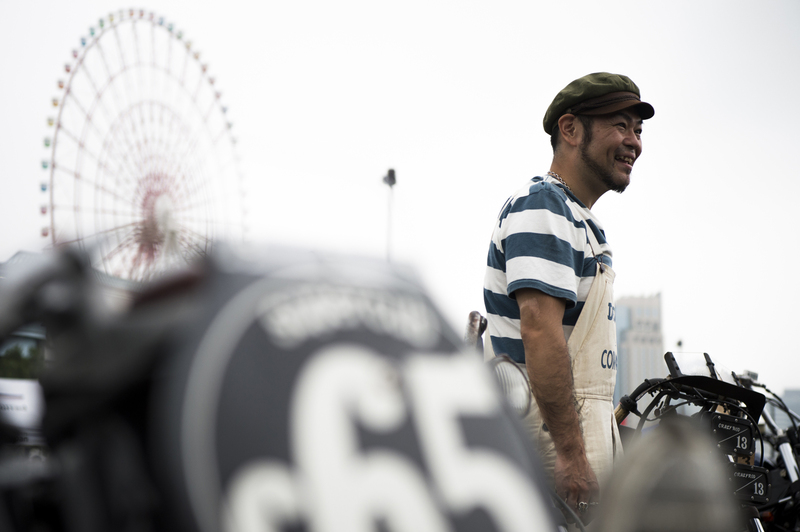 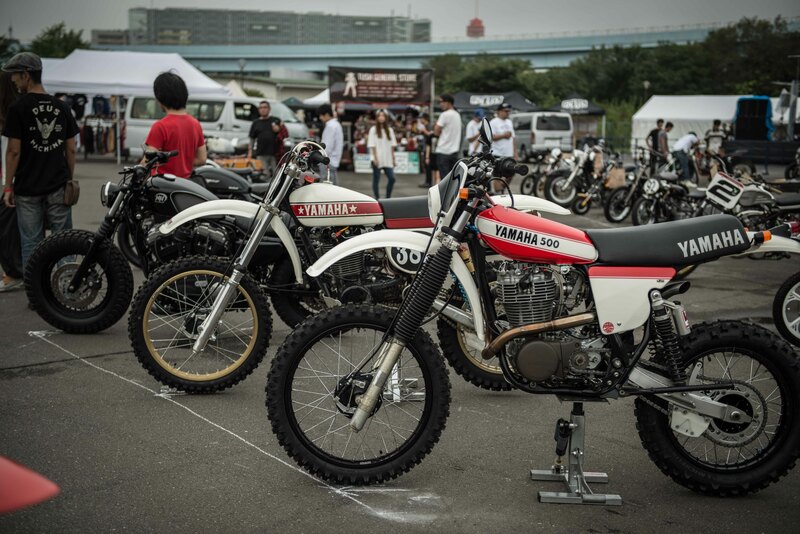 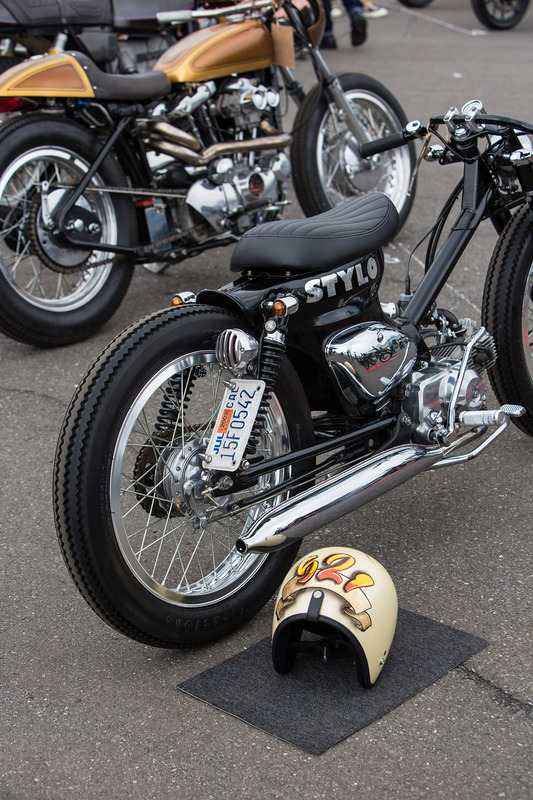 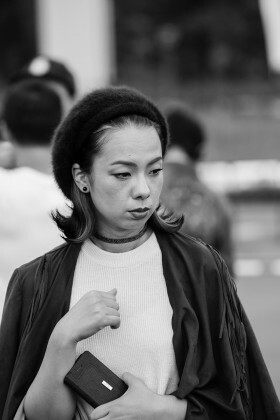 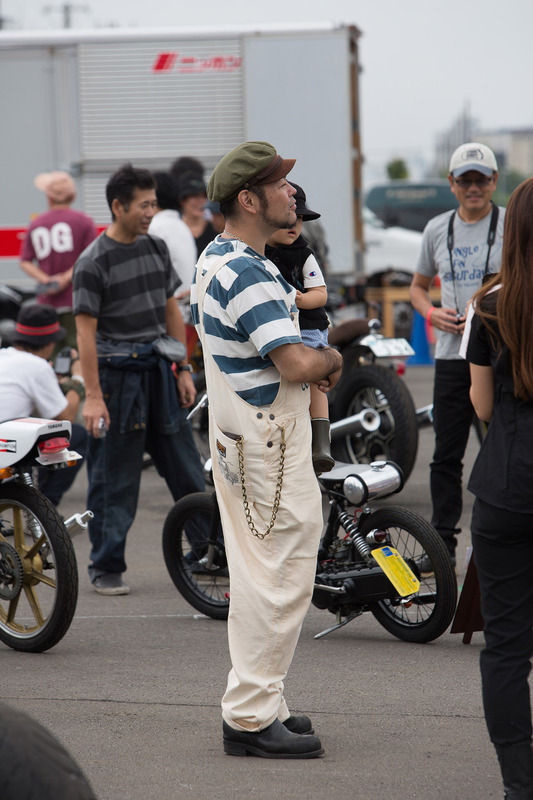 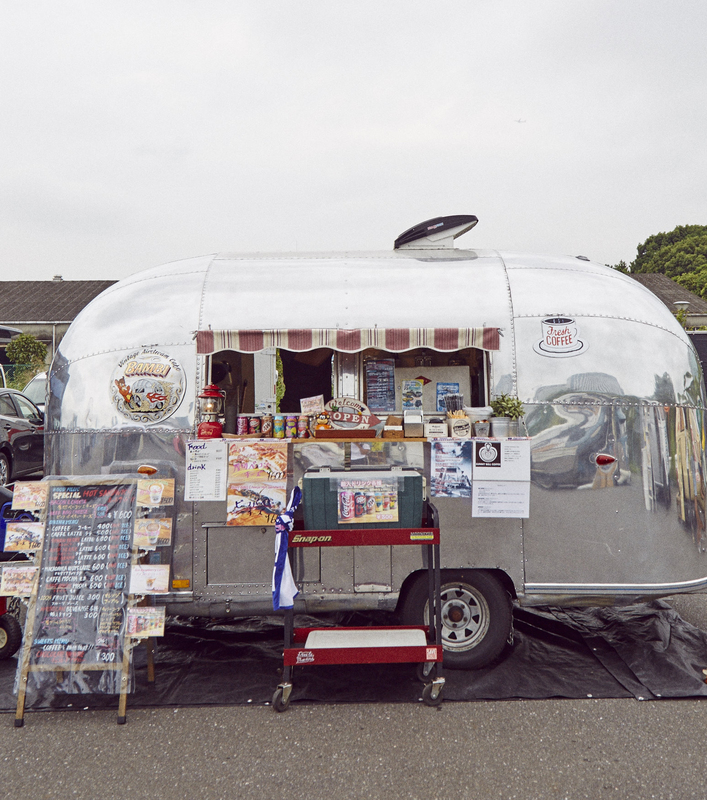 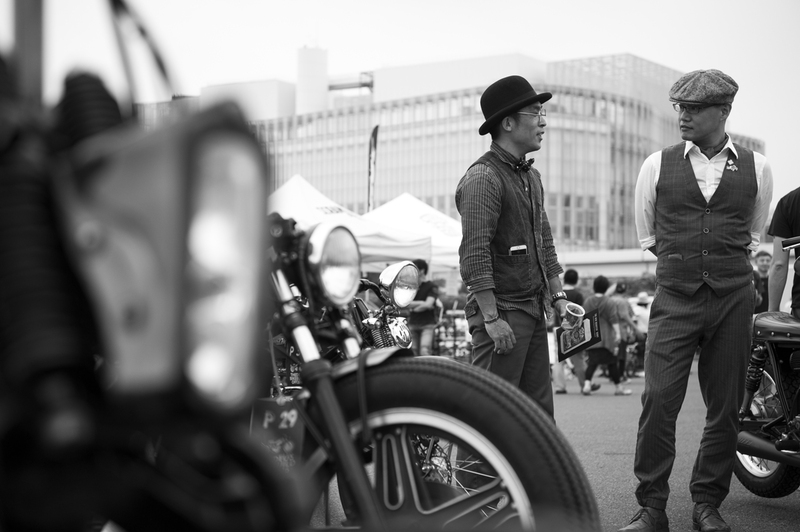 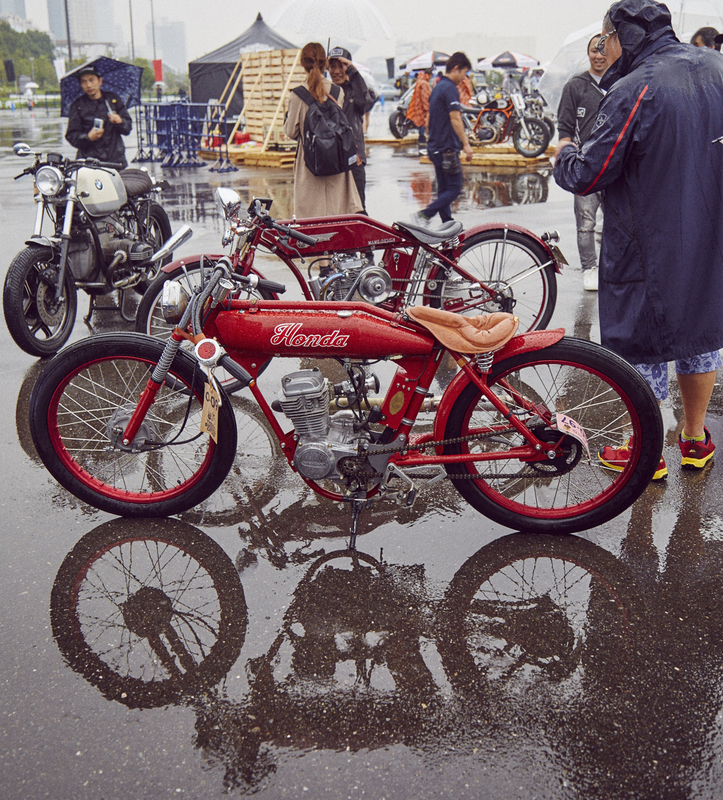 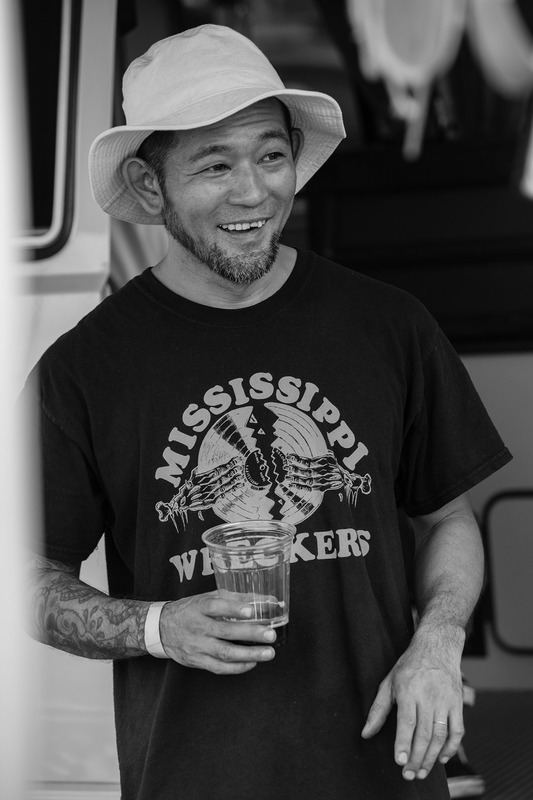 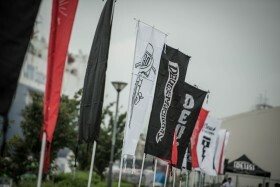 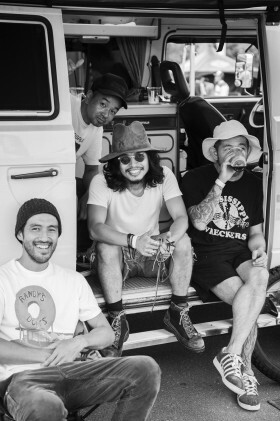 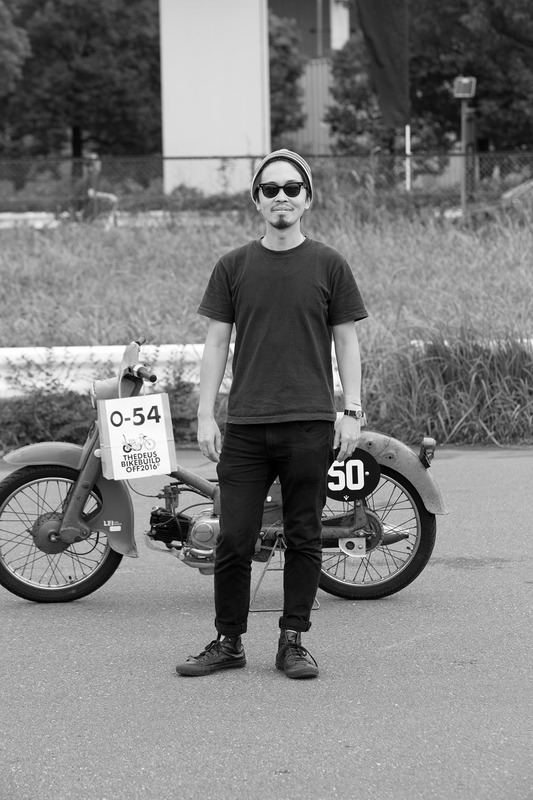 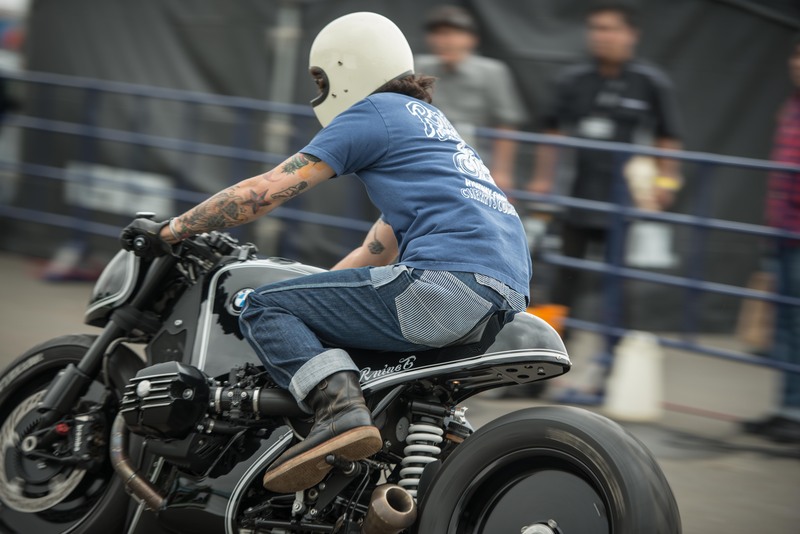 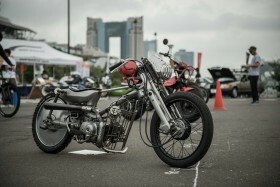 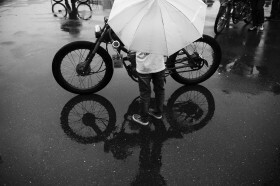 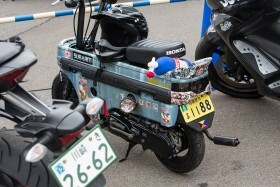 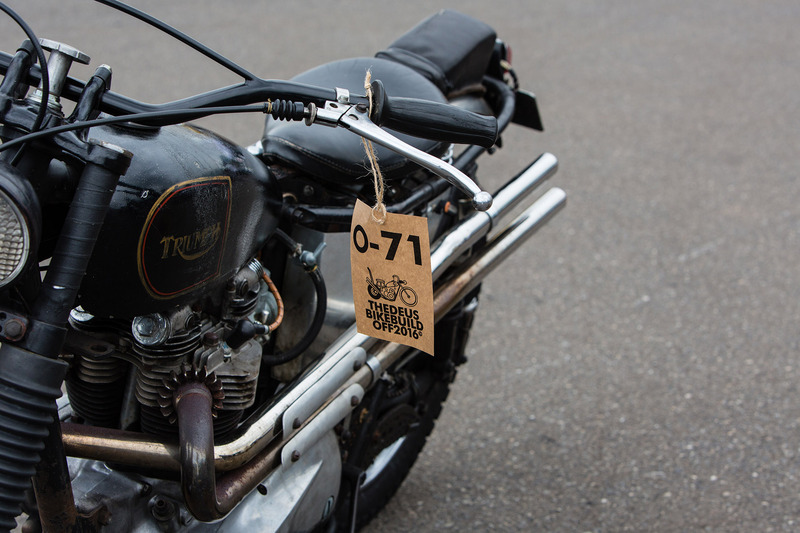 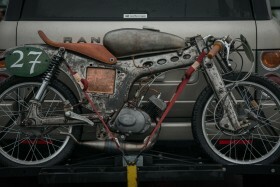 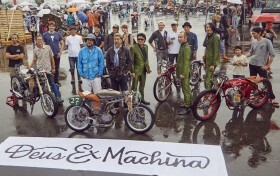 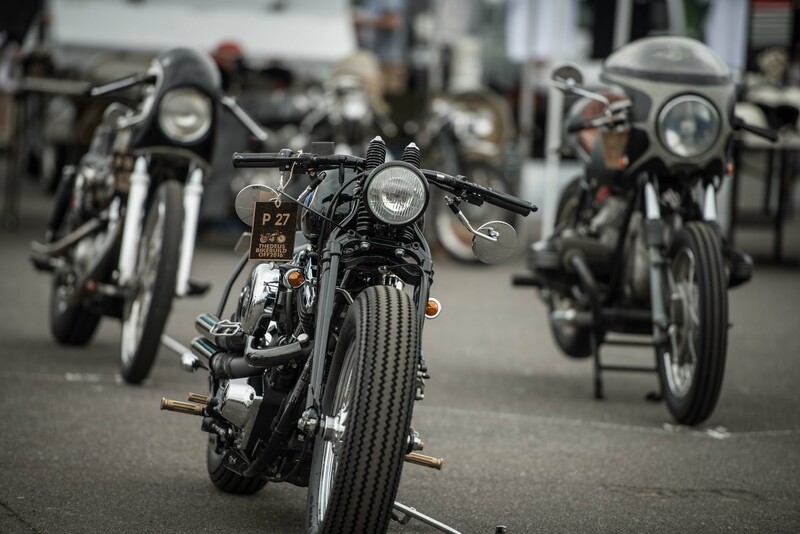 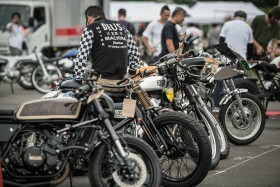 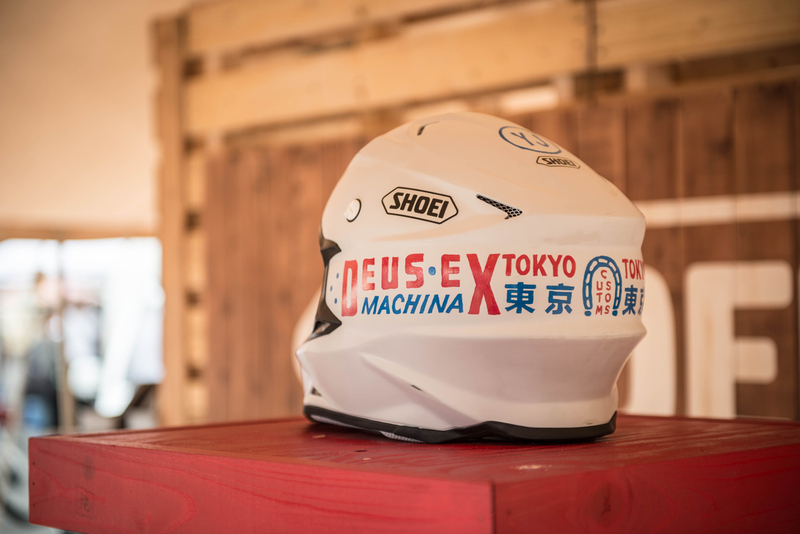 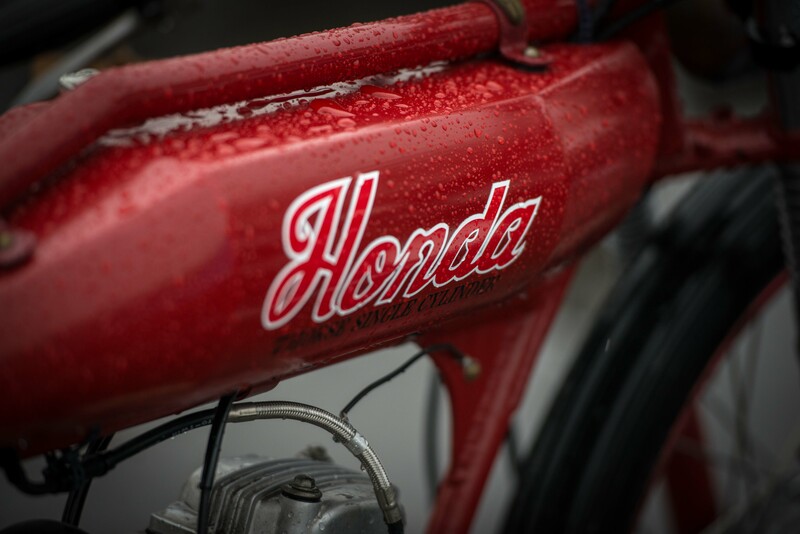 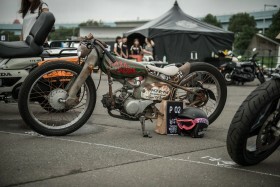 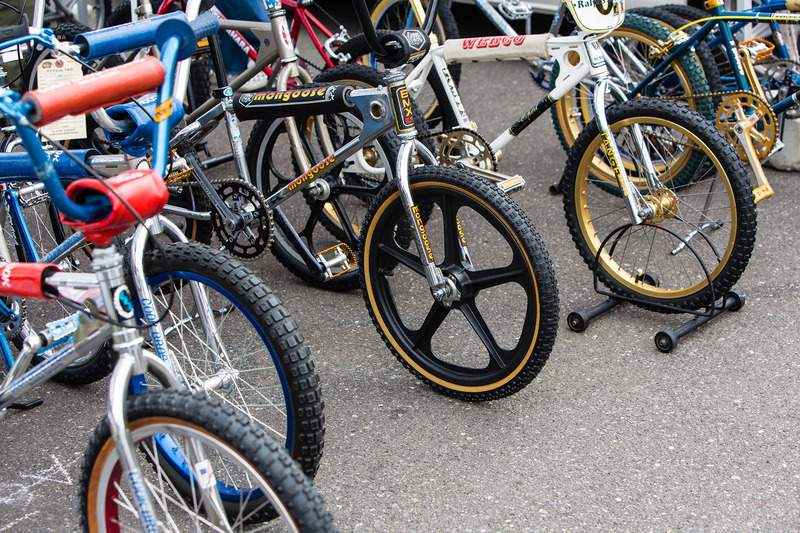 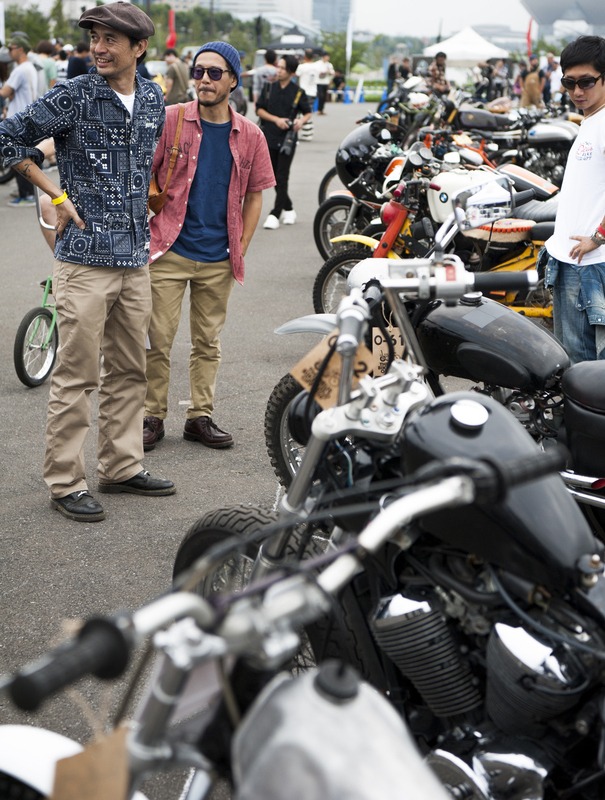 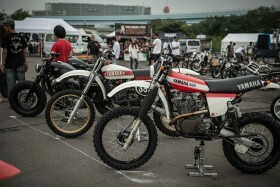 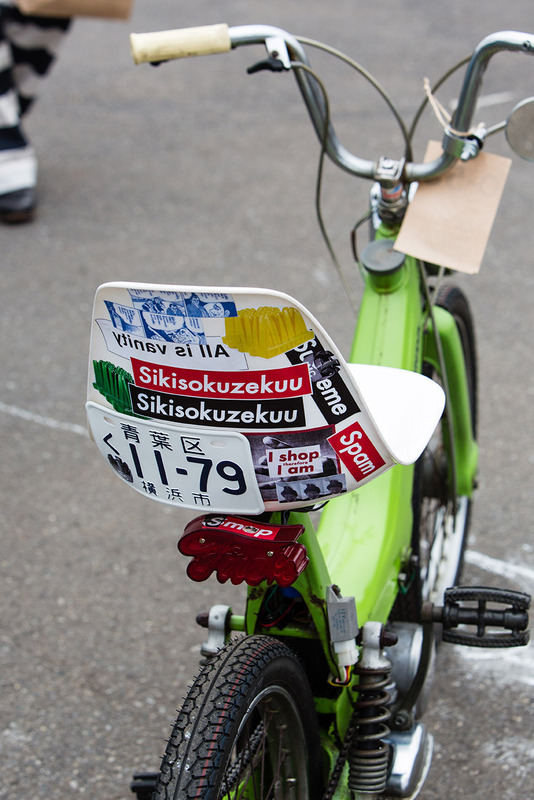 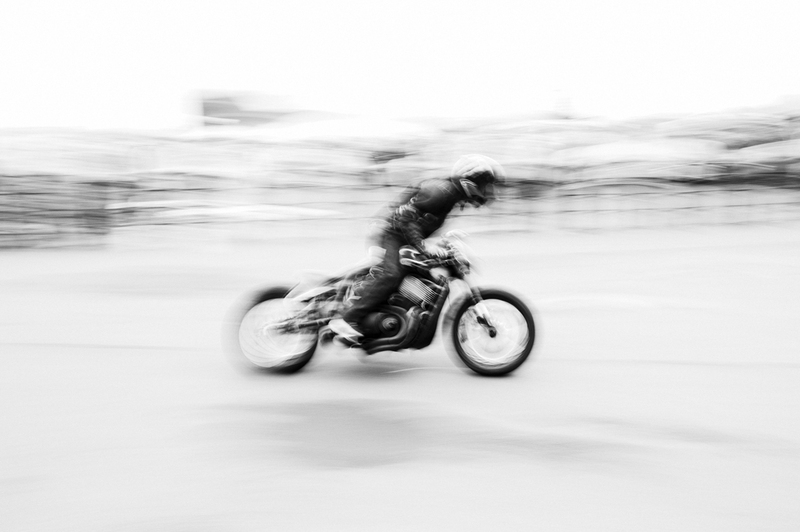 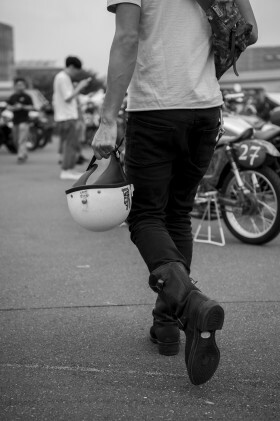 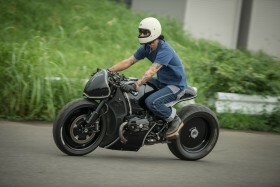 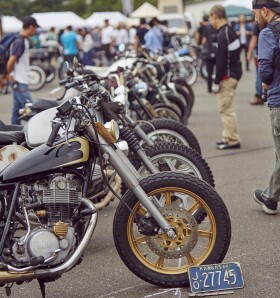 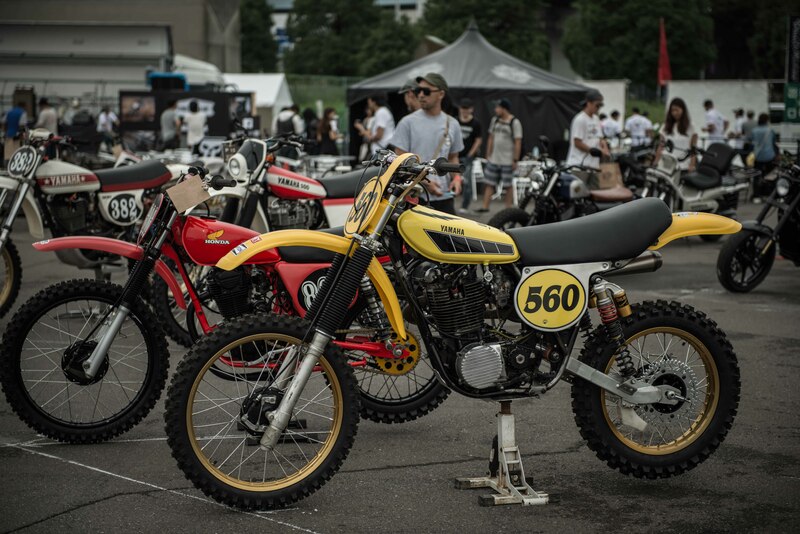 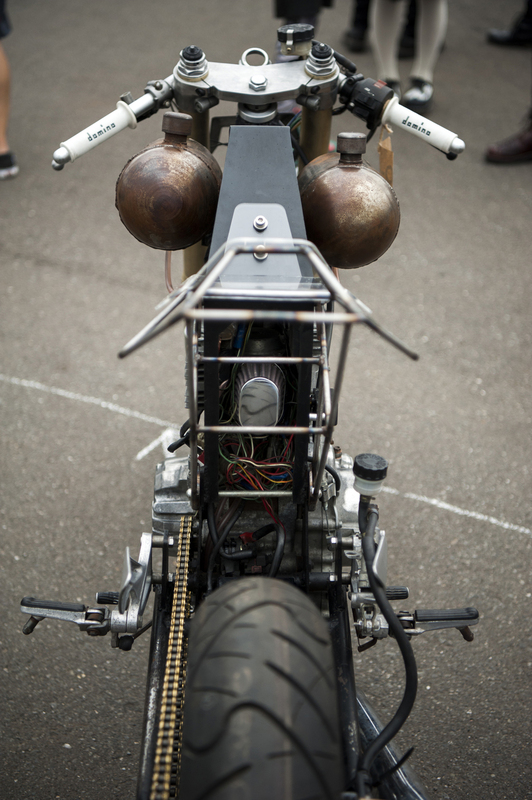 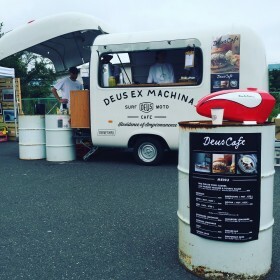 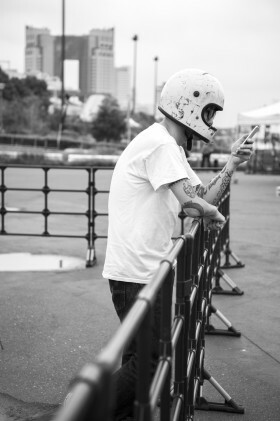 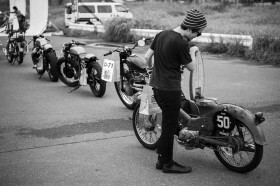 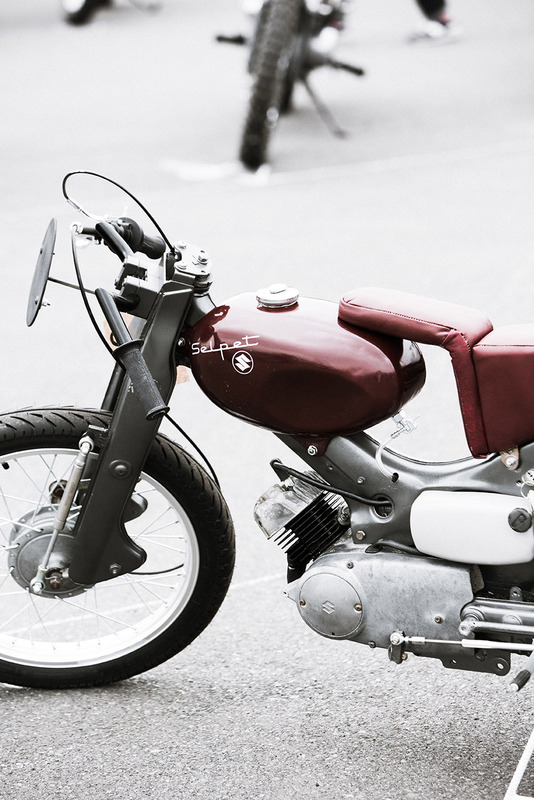 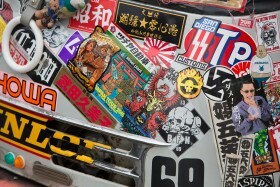 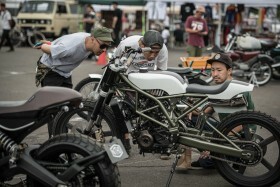 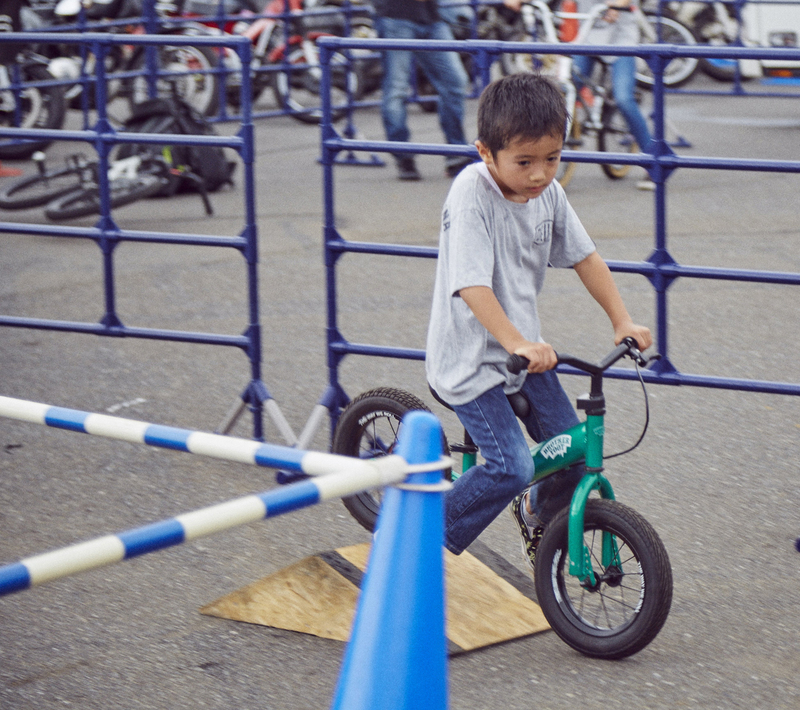 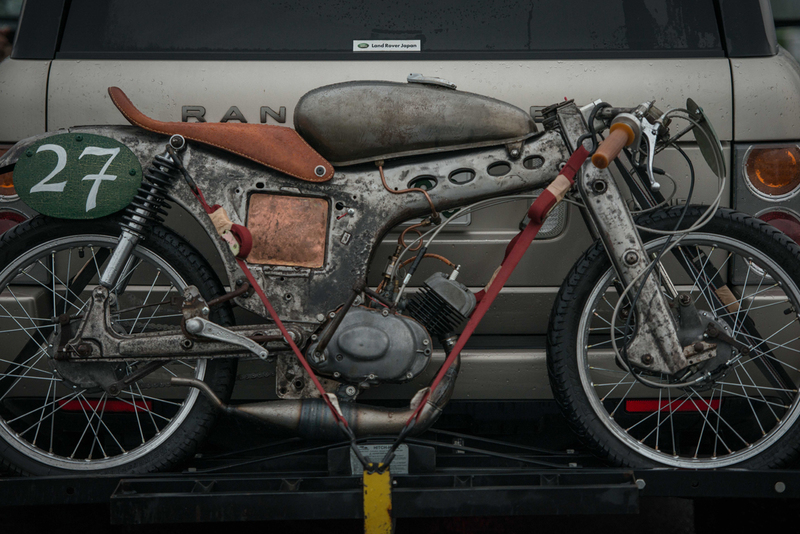 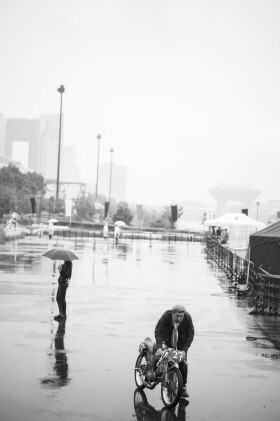 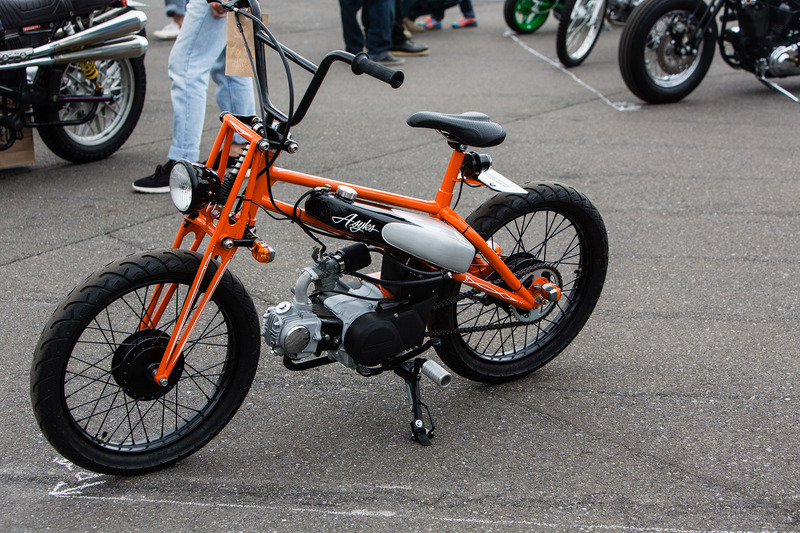 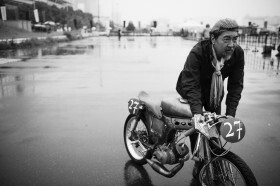 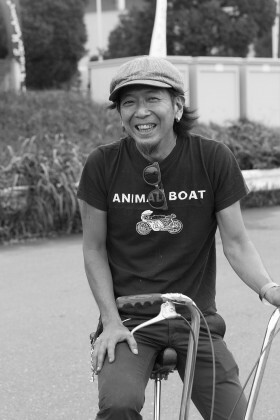 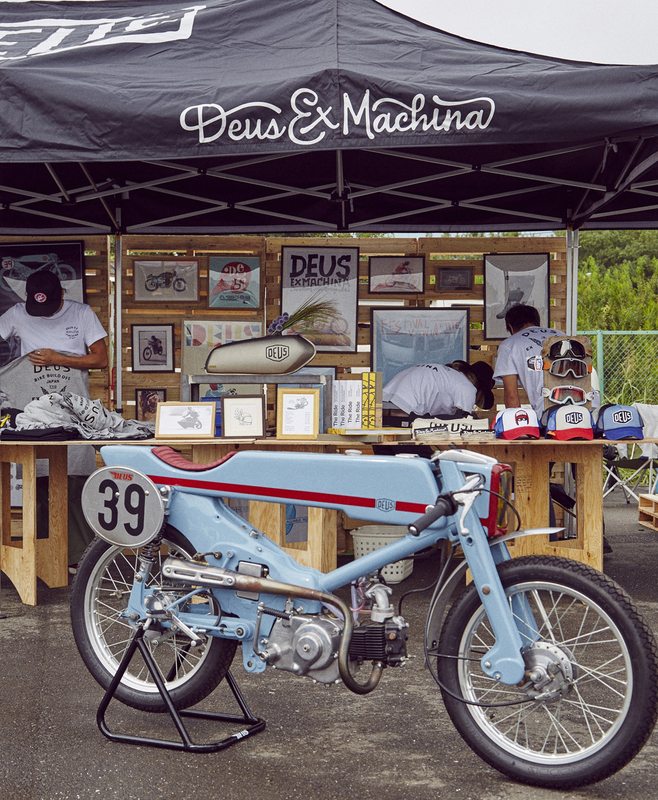 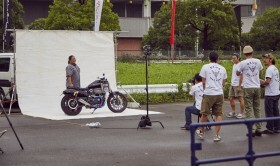 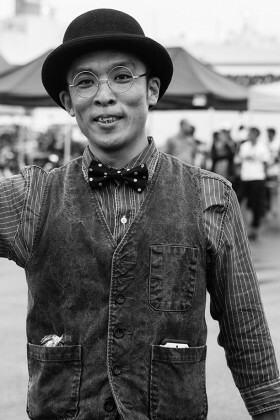 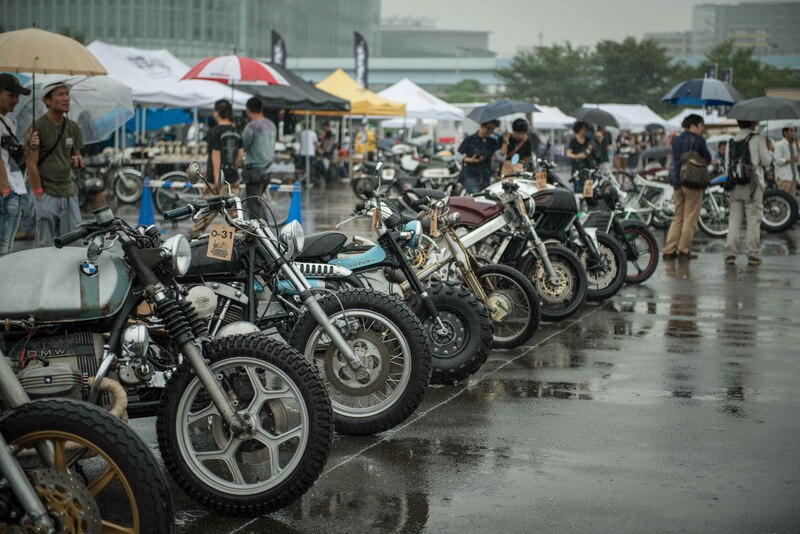 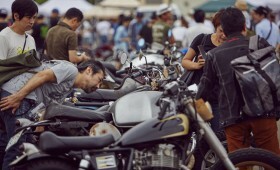 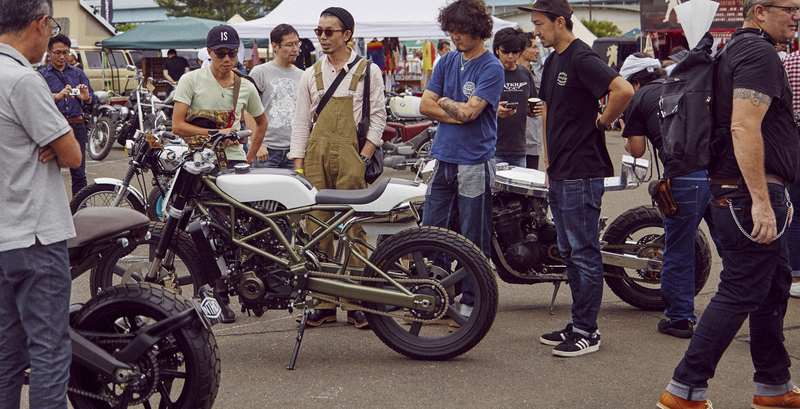 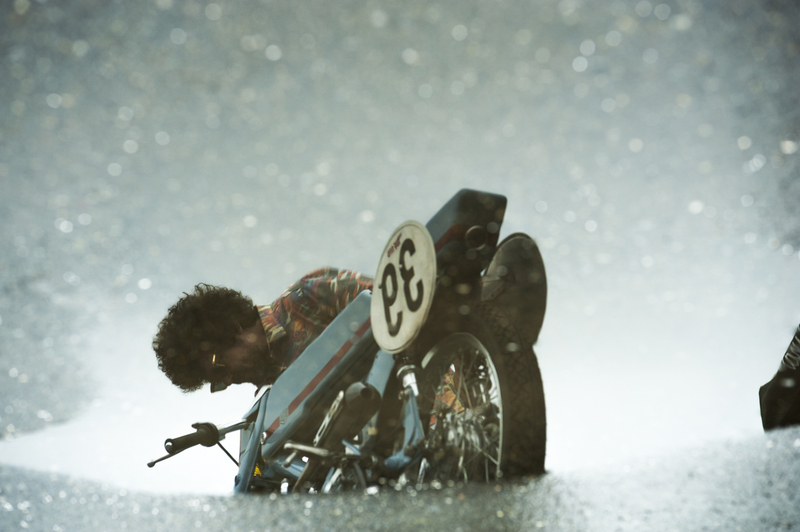 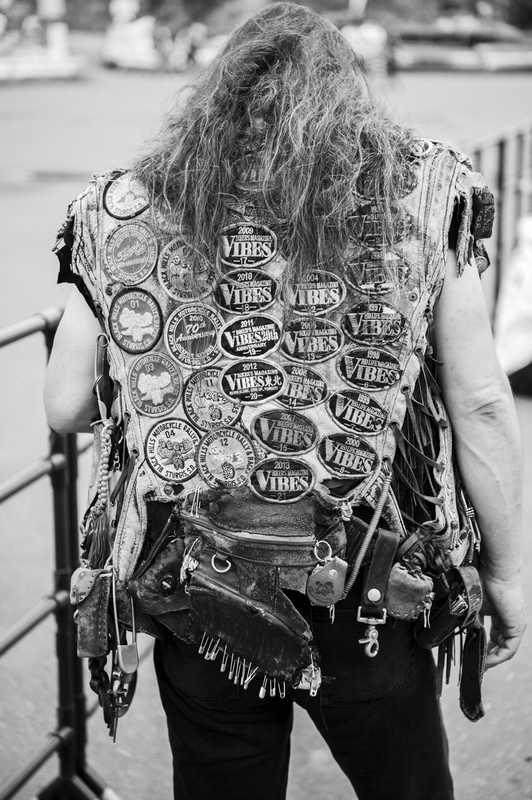 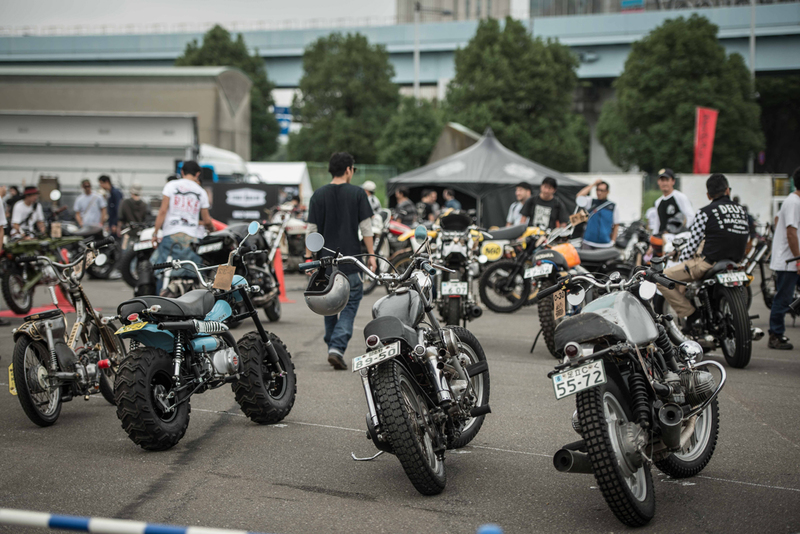 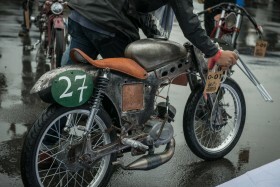 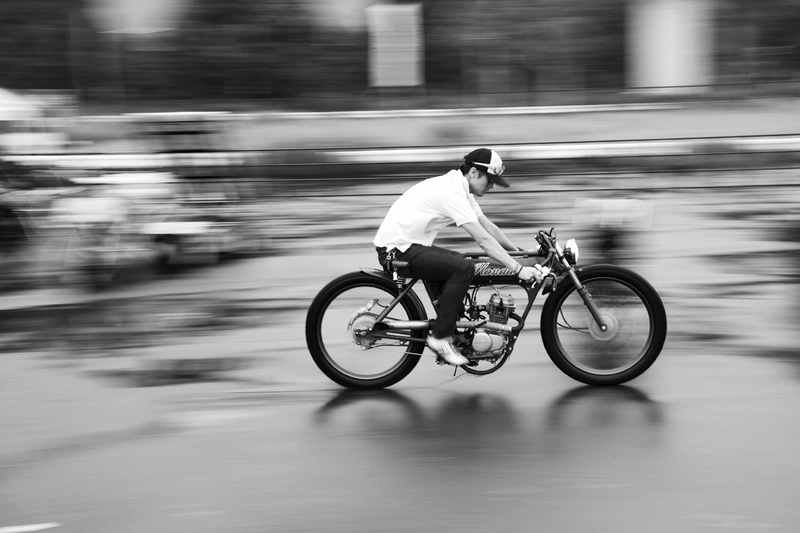 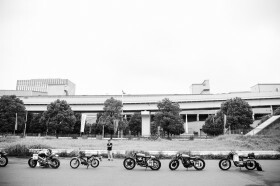 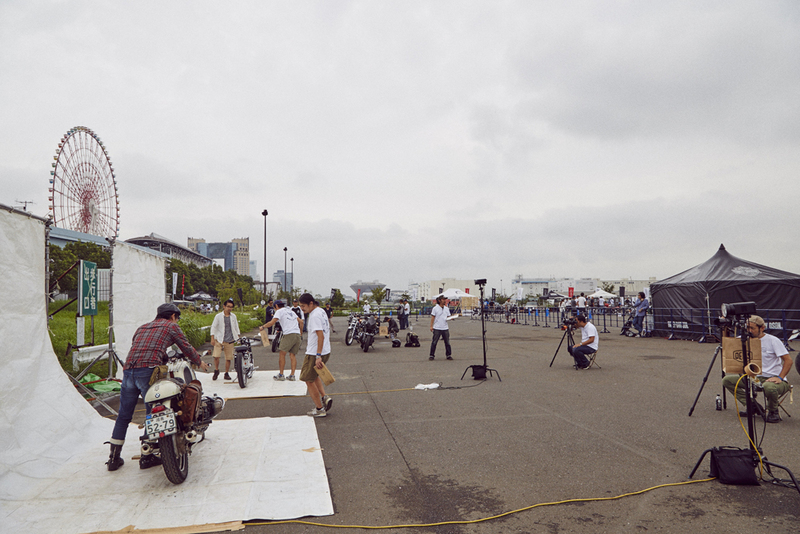 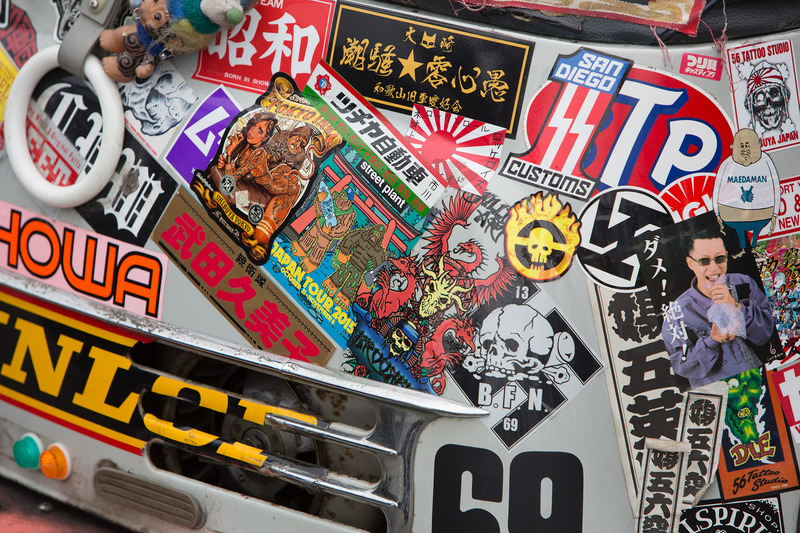 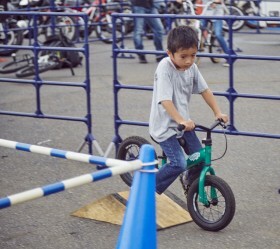 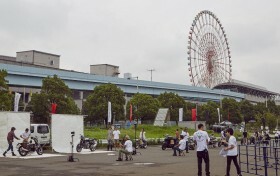 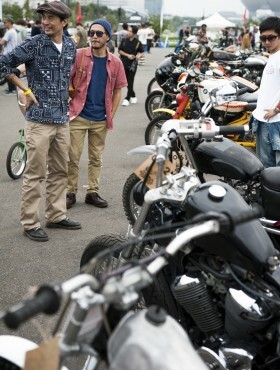 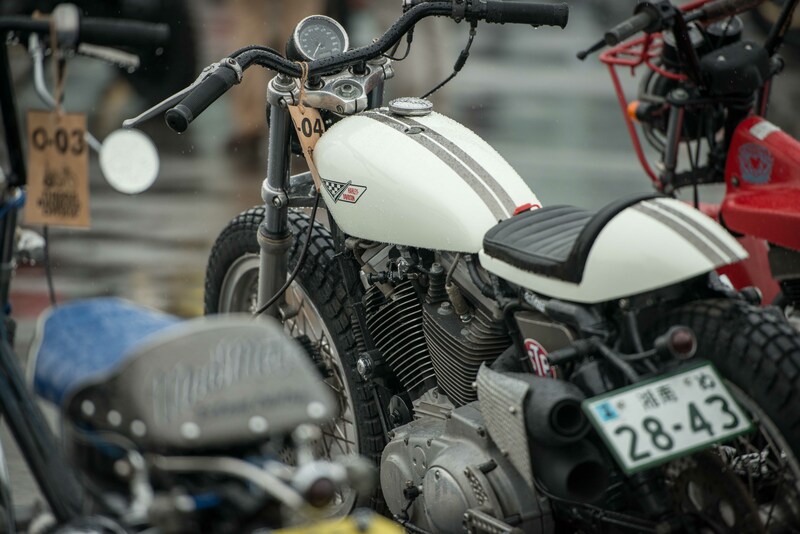 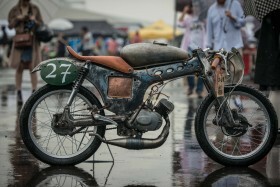 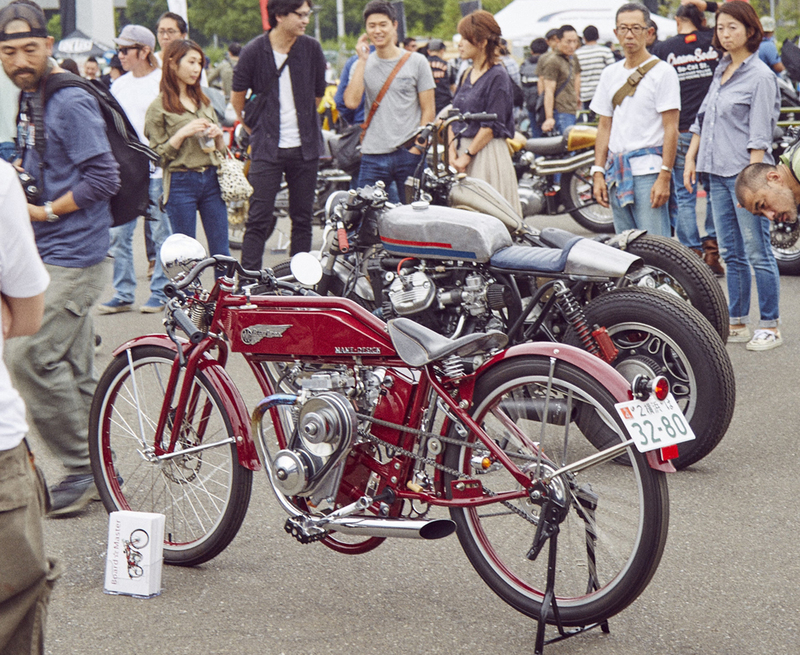 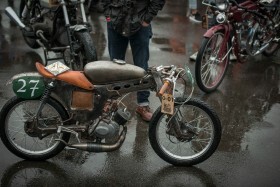 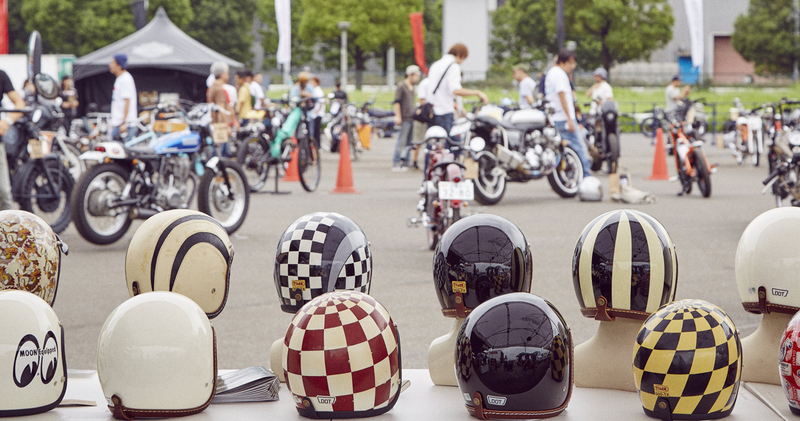 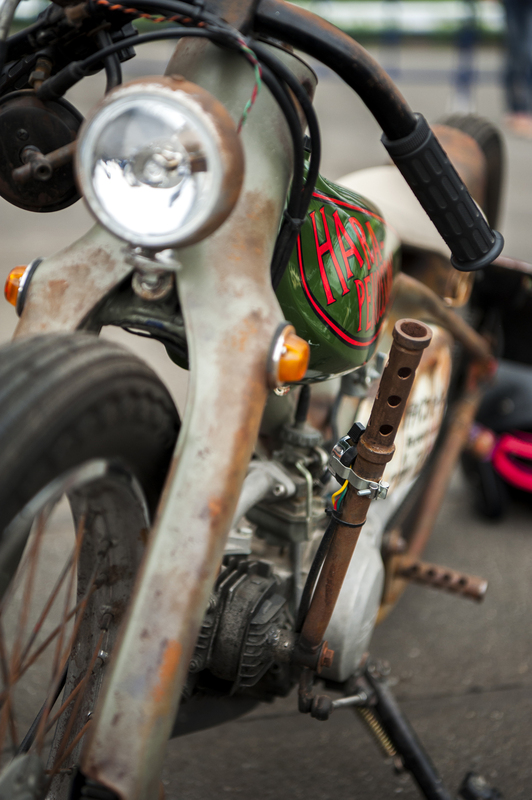 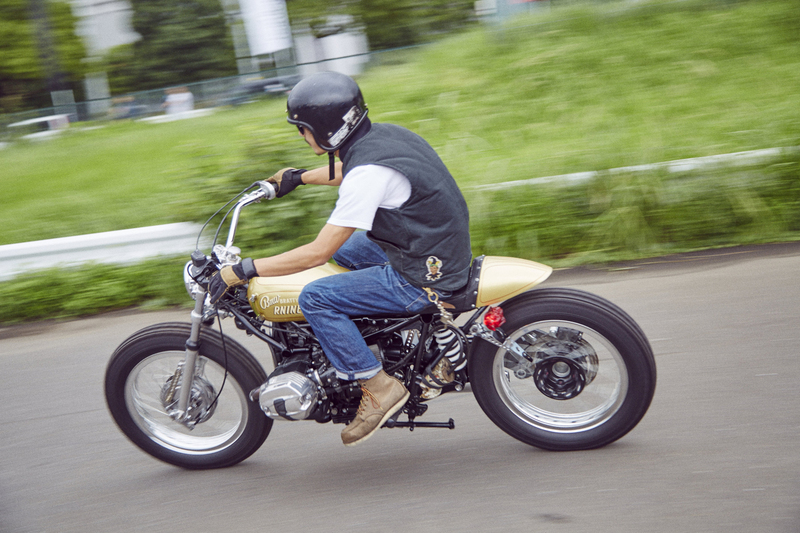 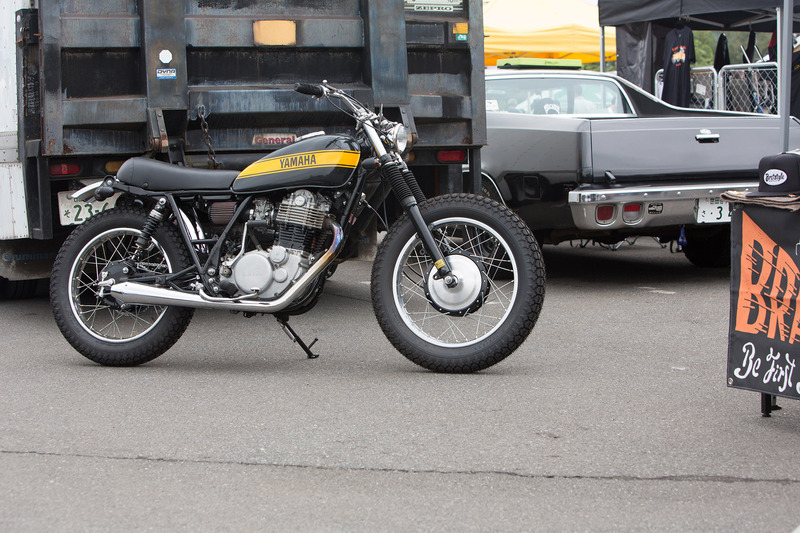 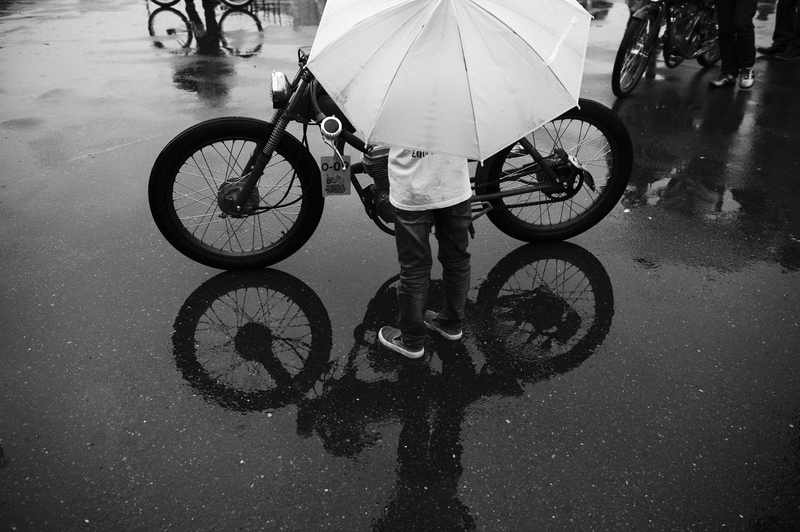 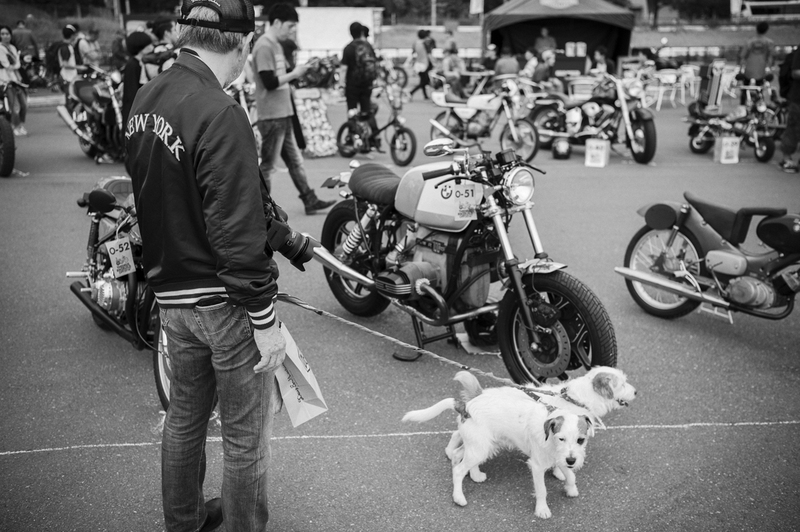 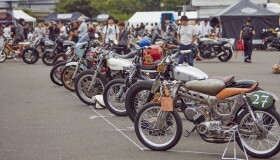 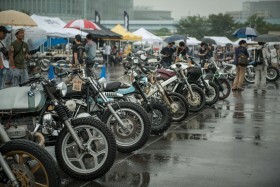 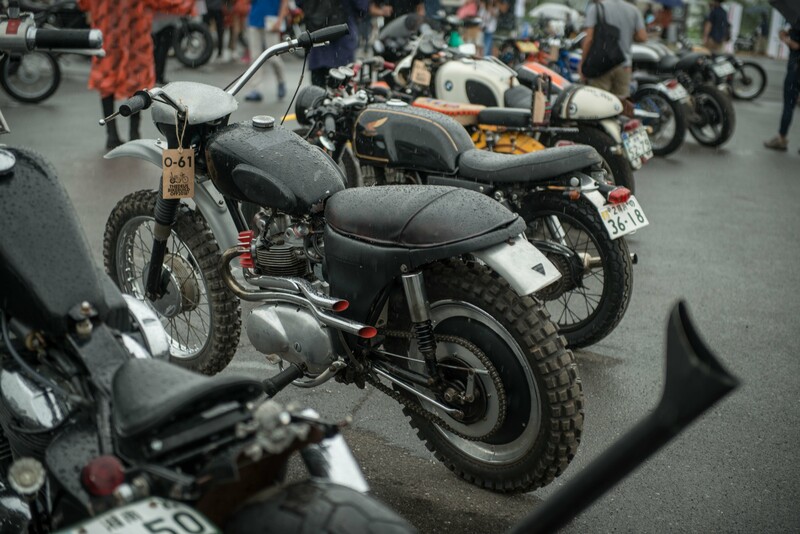 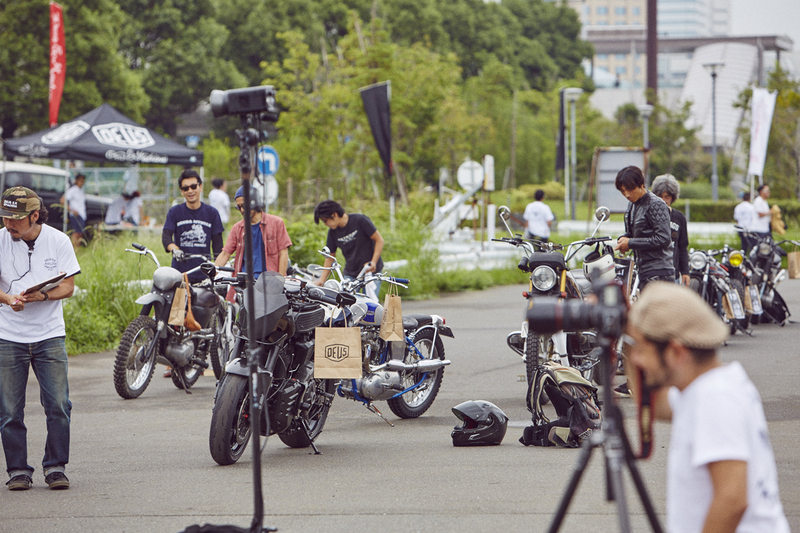 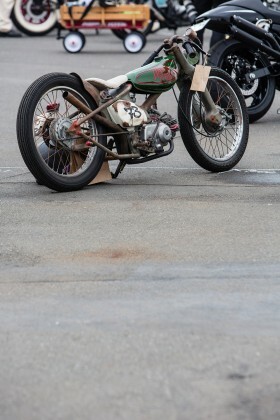 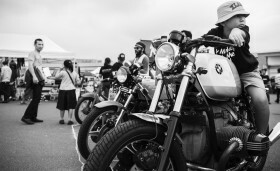 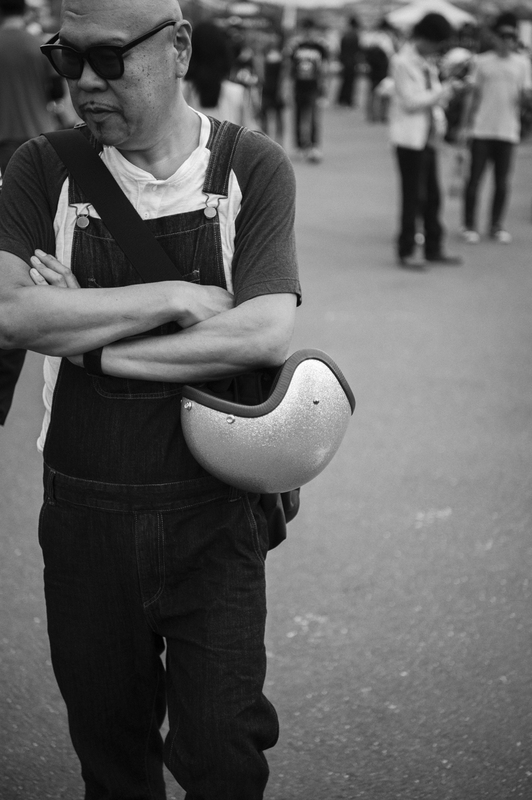 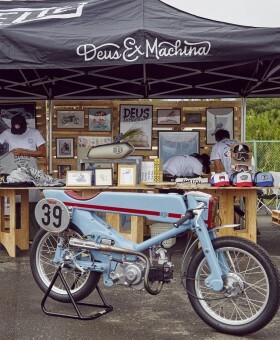 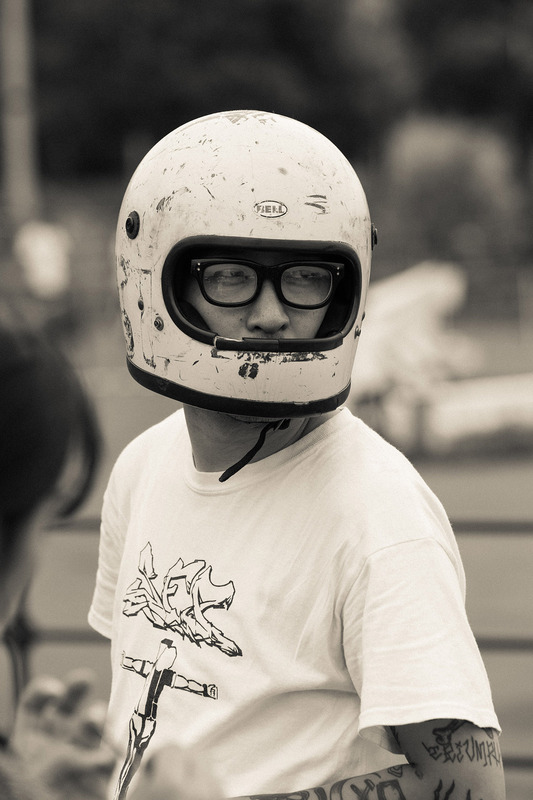 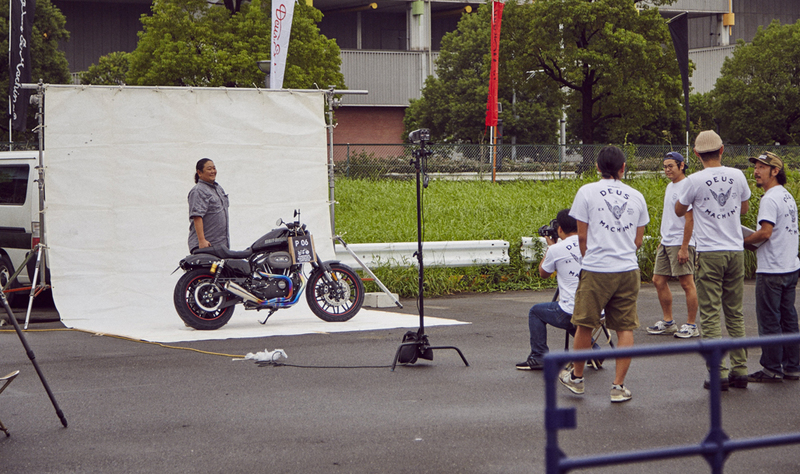 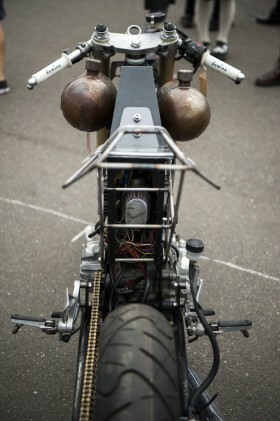 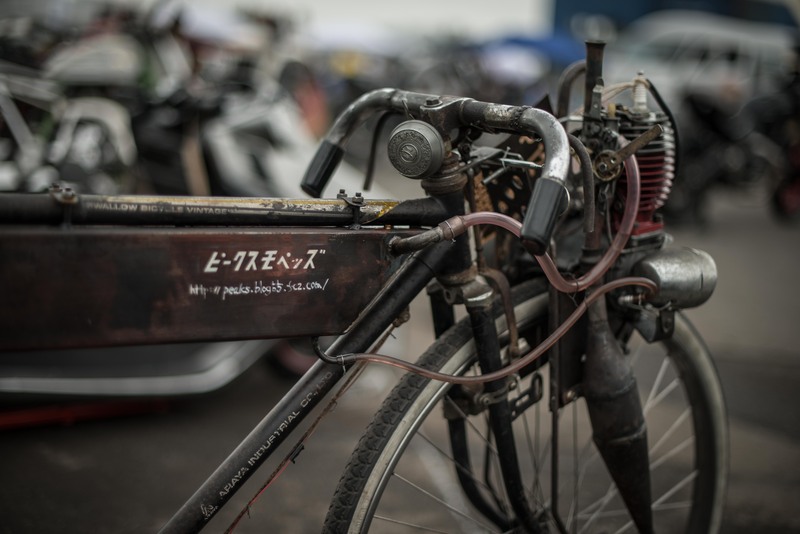 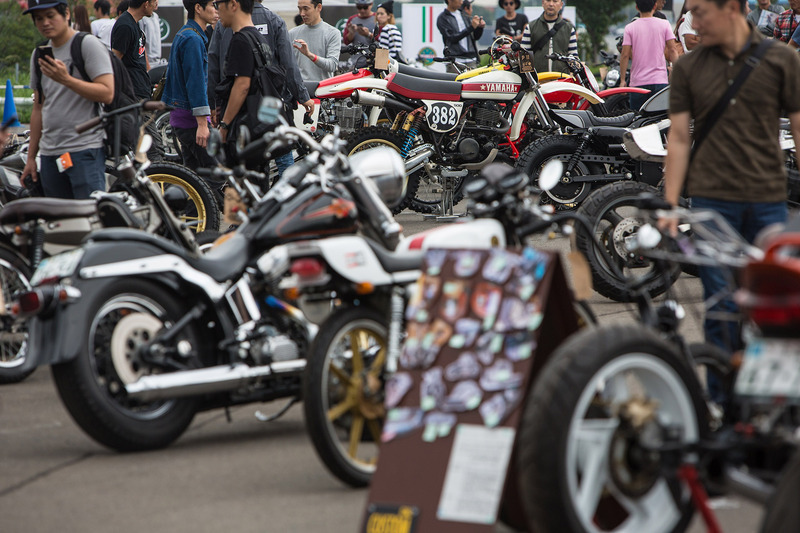 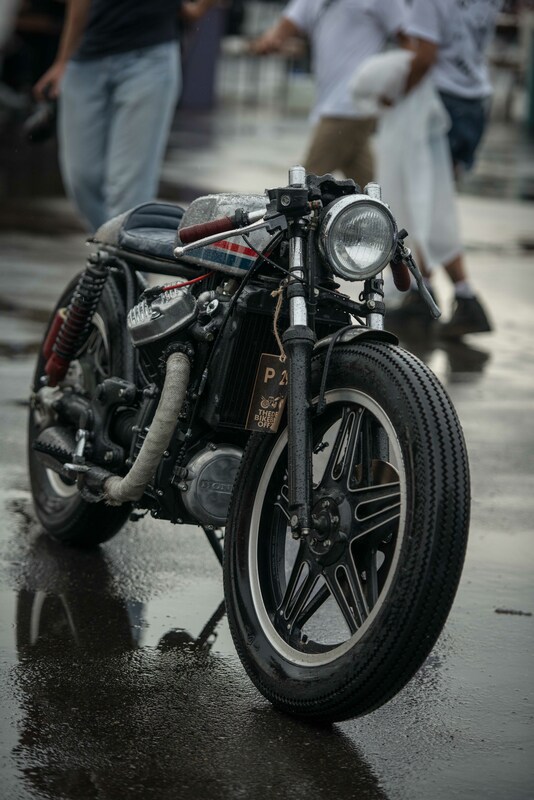 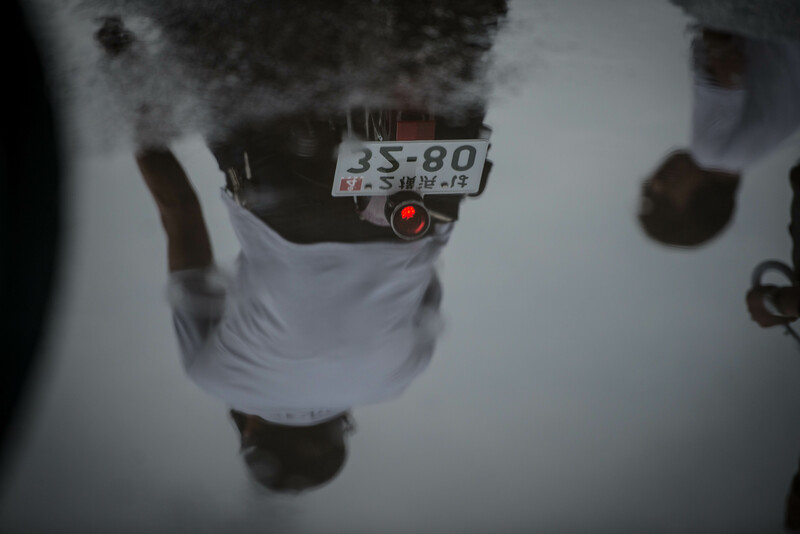 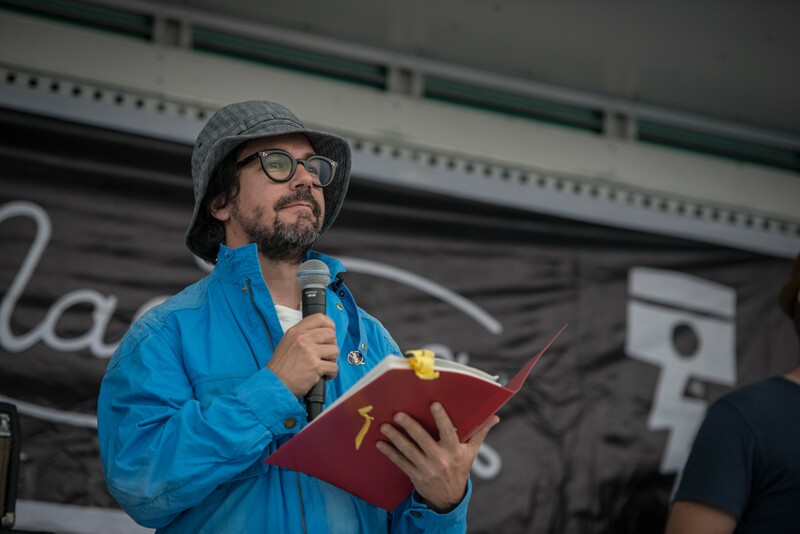 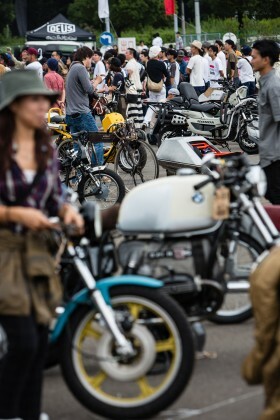 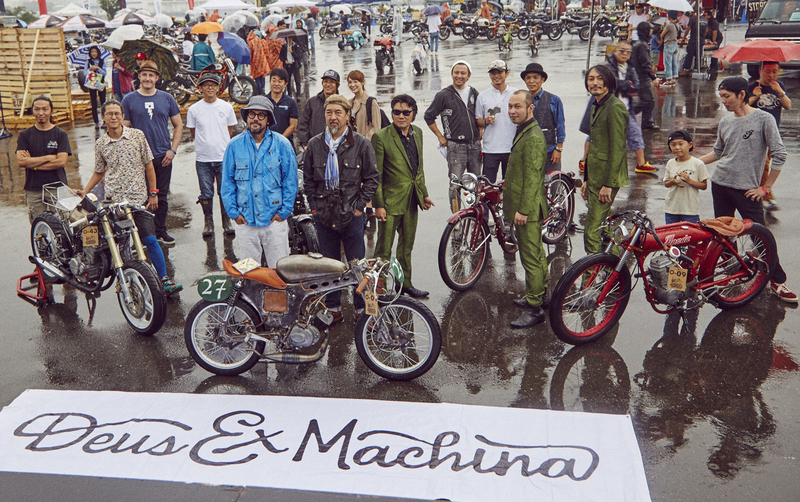 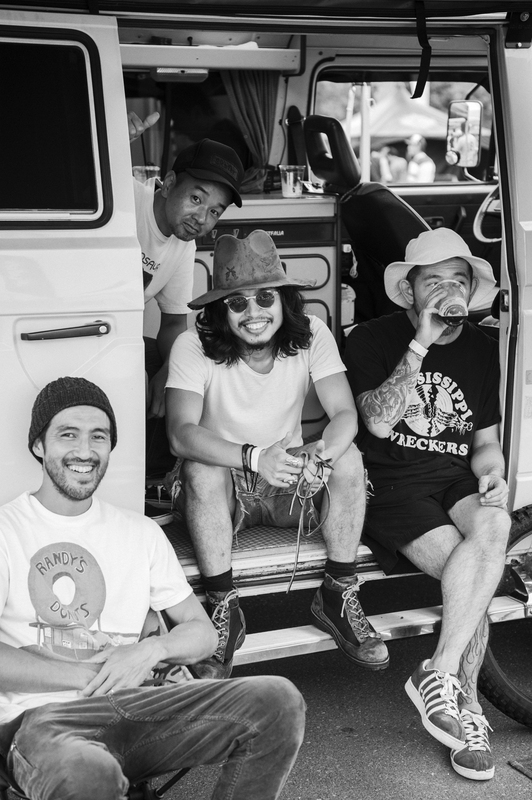 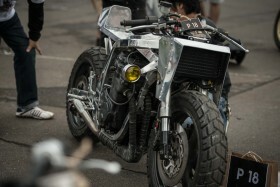 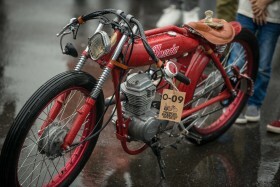 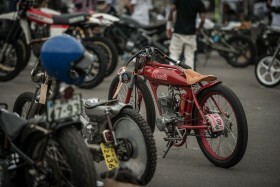 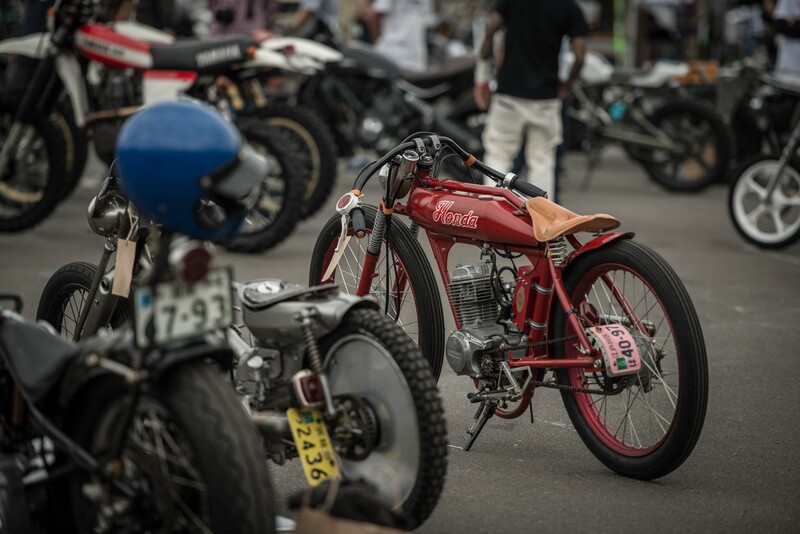 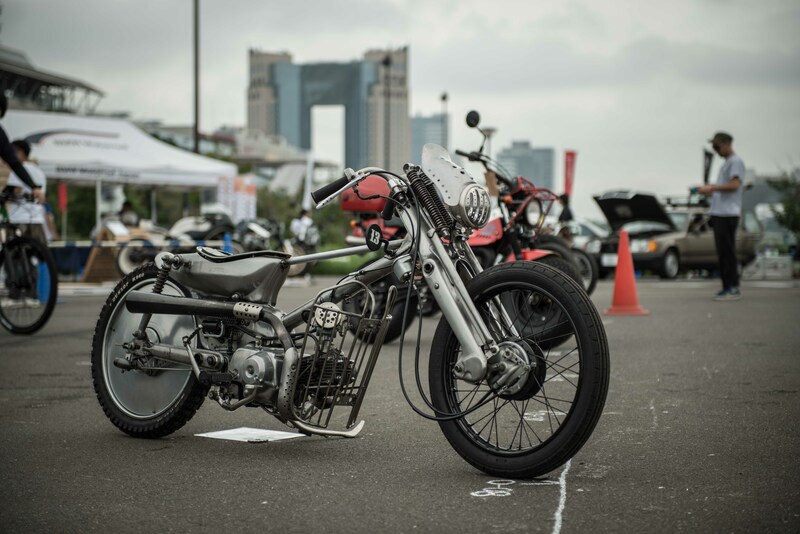 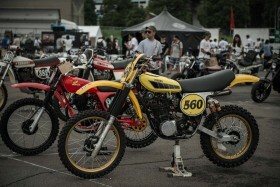 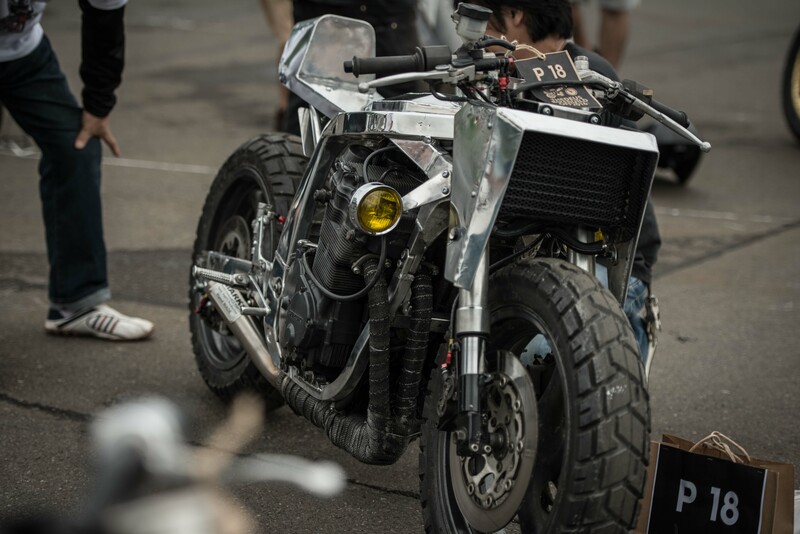 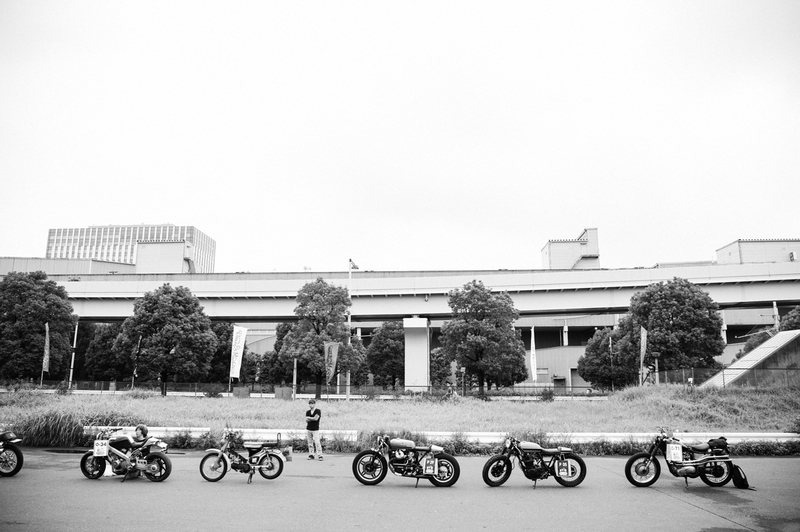 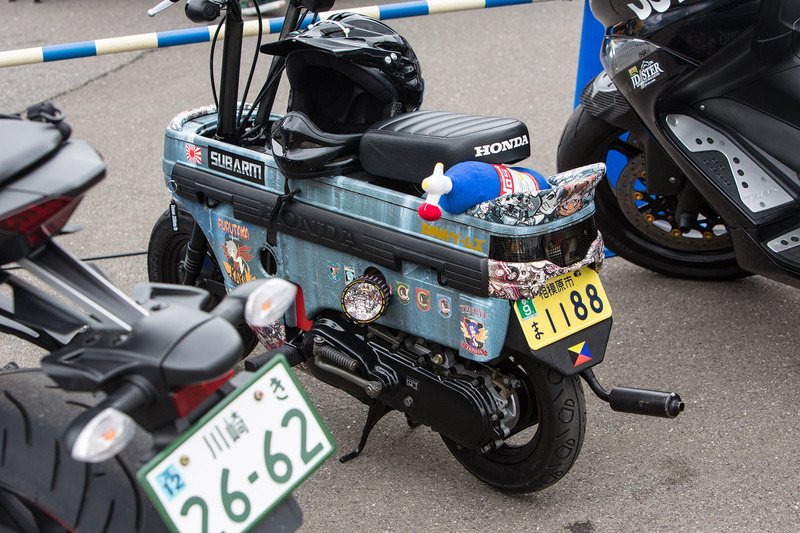 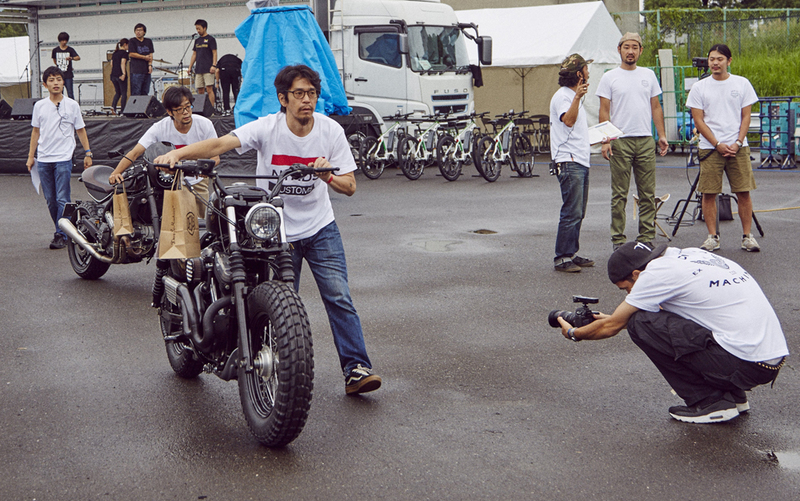 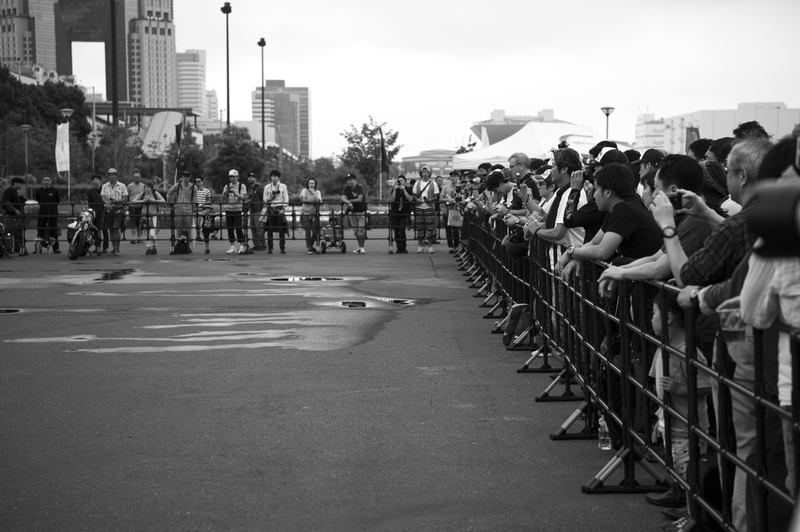 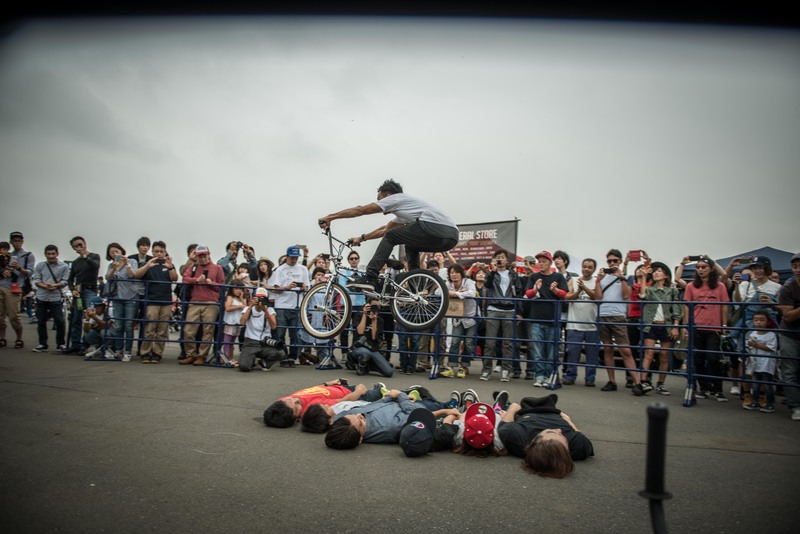 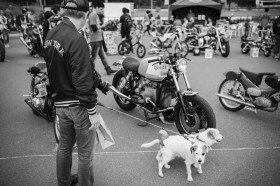 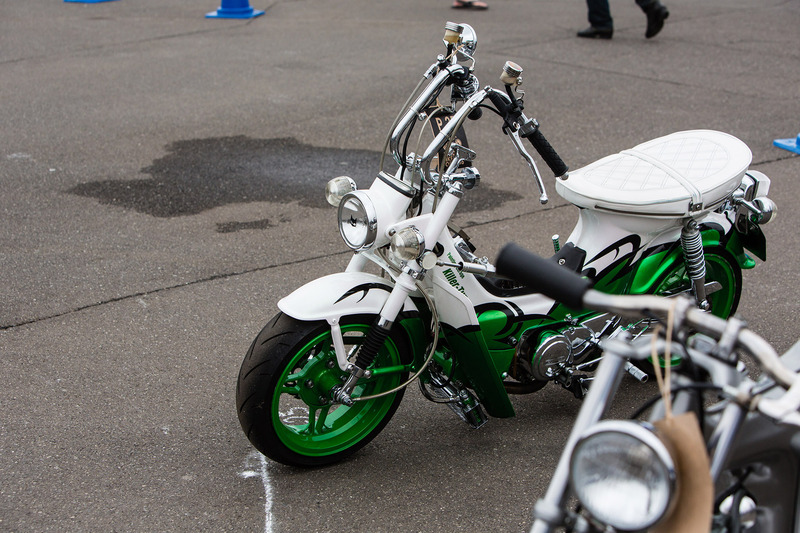 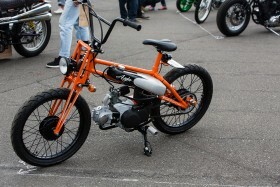 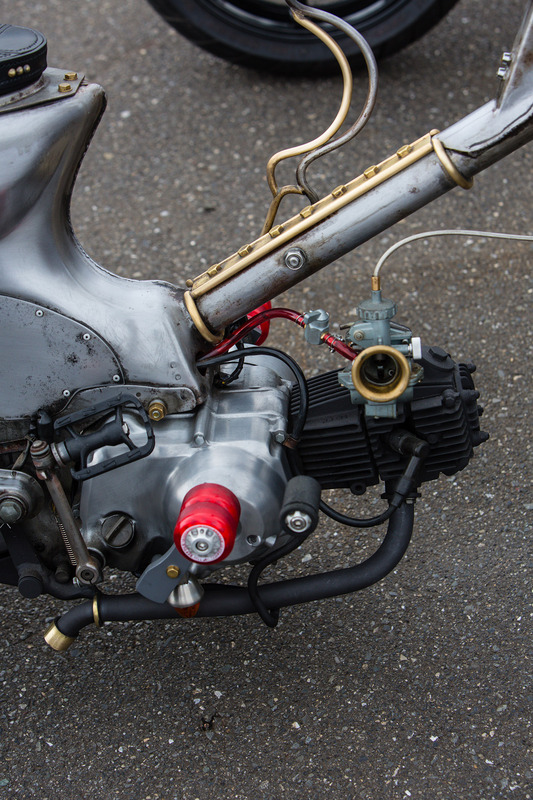 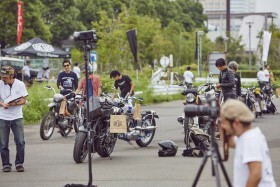 A rag-tag army of moto rebels, hell bent on birthing a mountain of unorthodox metal with a single goal in mind – a full frontal assault on the island of Odaiba in Tokyo Bay – The Deus Japan Bike Build Off 2016. 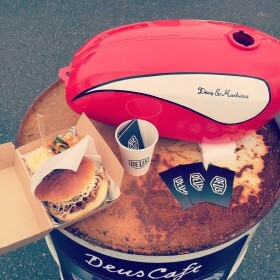 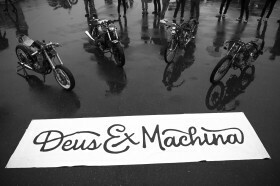 While Mother Nature proved only fleetingly cooperative, the builders, judges and Deus crew soldiered on under sodden skies unperturbed. 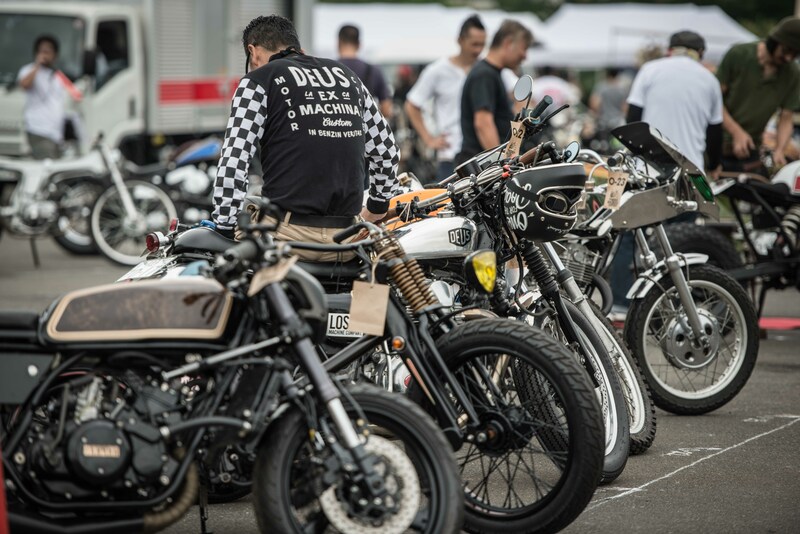 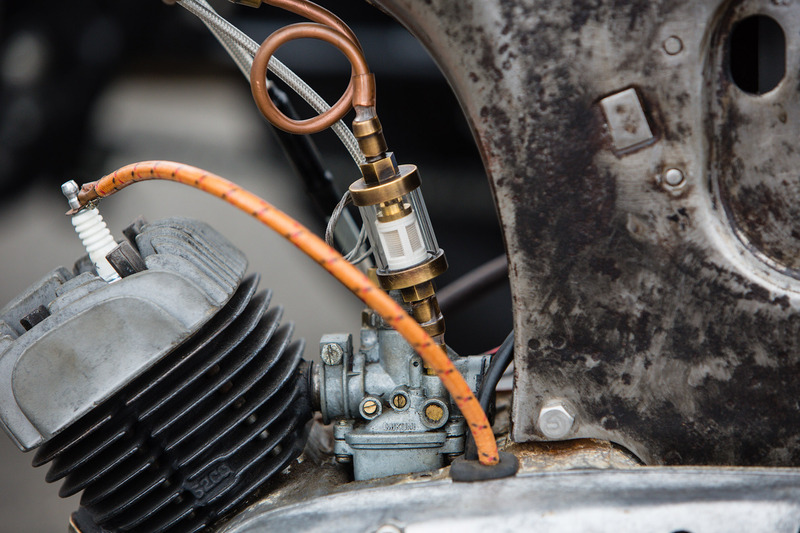 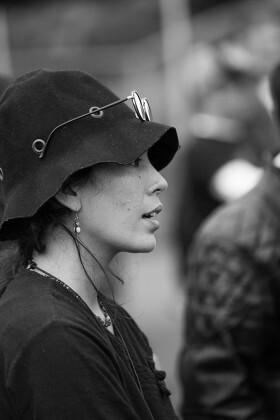 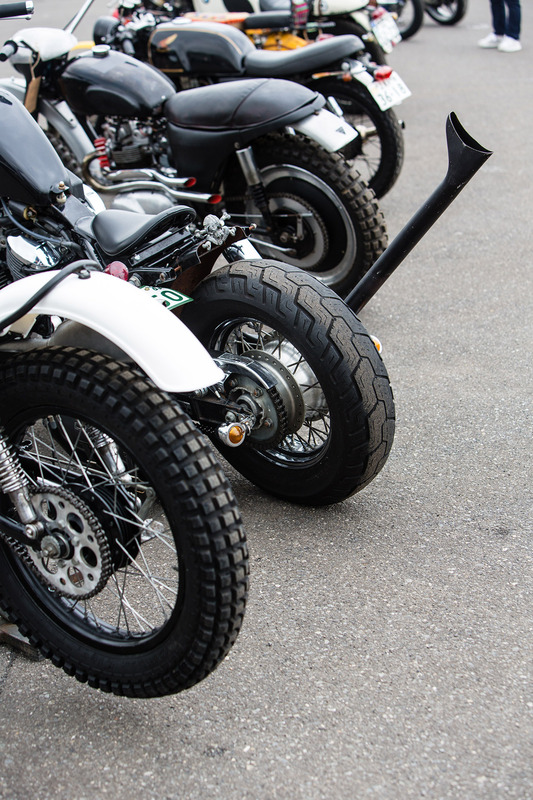 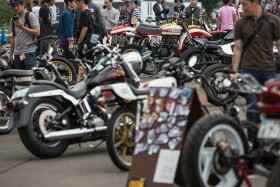 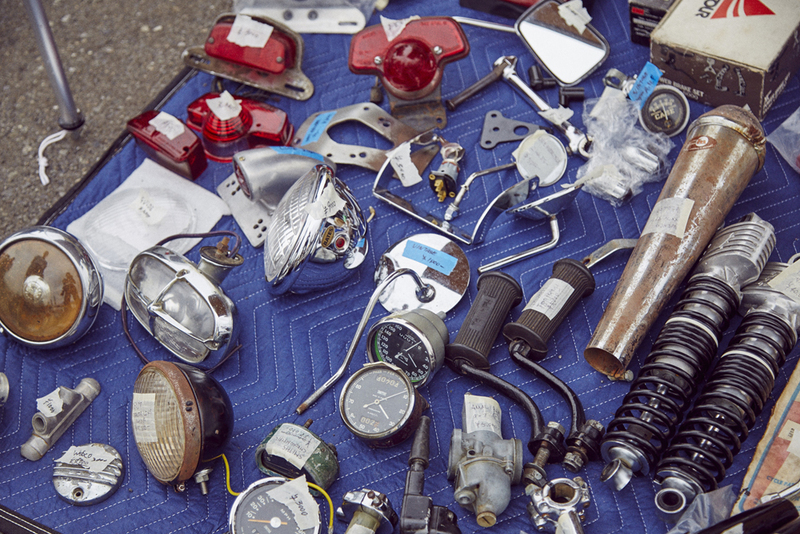 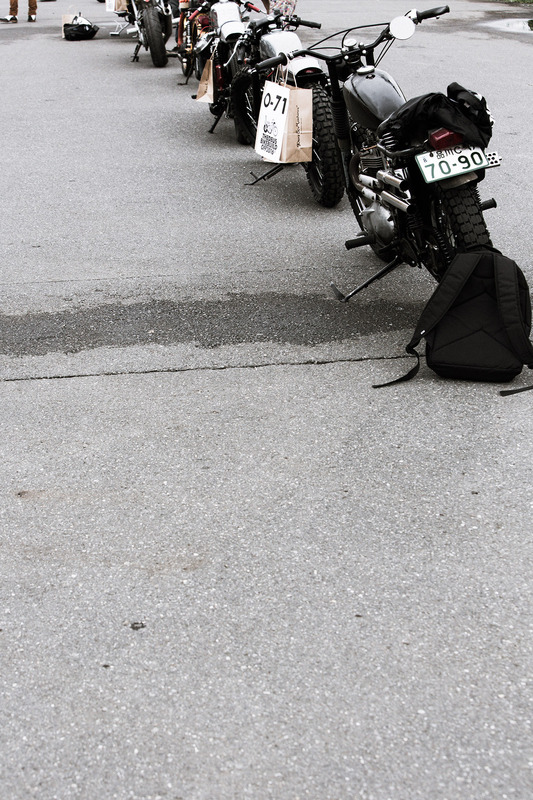 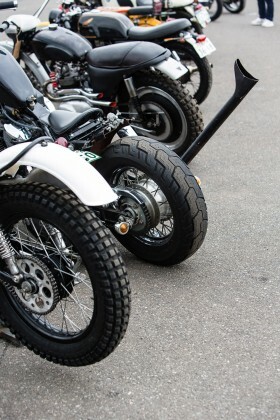 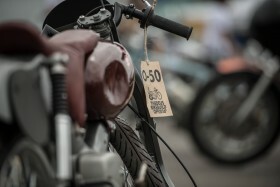 The day’s 102 entrants rode, wheeled or pushed their labours of love to the rally point as an additional 350 plus machines and their riders filled the carpark, eager to explore the oily sensory feast assembling before them. 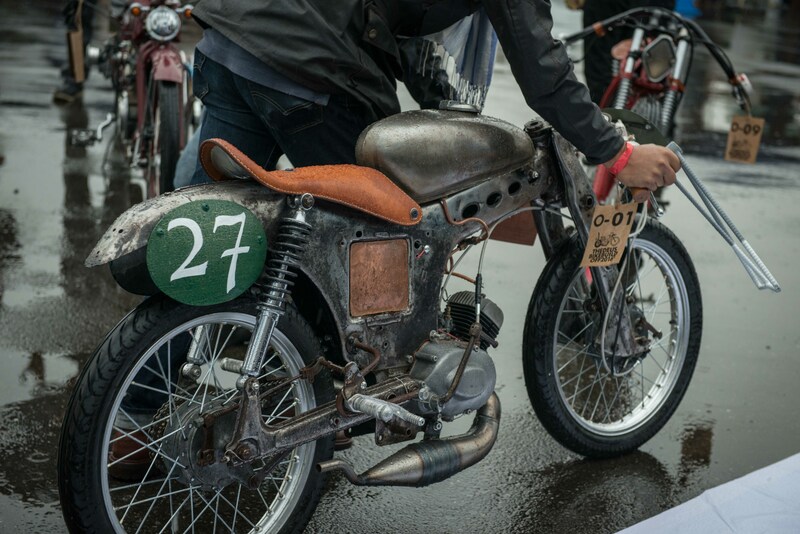 Competitors coaxed engines to life for regulation runs and a moment of glory under flash bulbs before taking their place in the show. 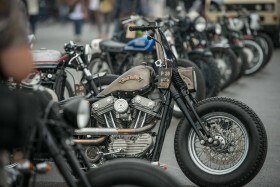 Sponsor’s Metzeler, Harley Davidson, BMW, Triumph and Ducati provided a barrage of custom heavy artillery to help pave the way for the impressive swarm forming. 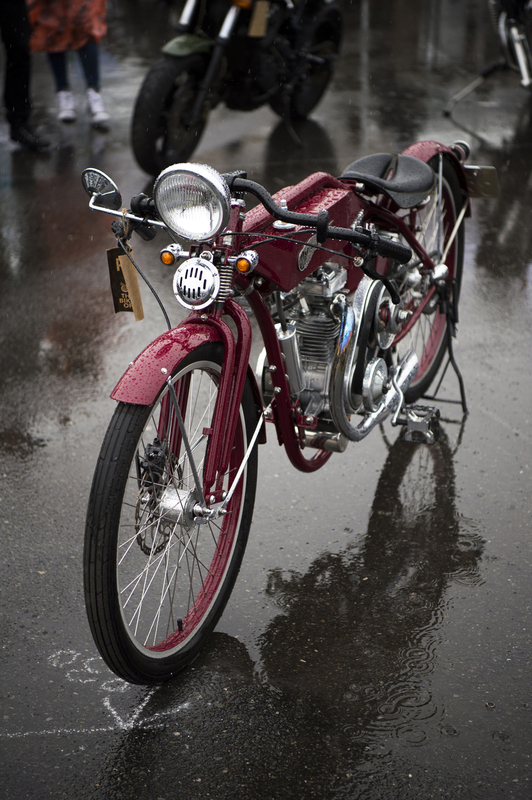 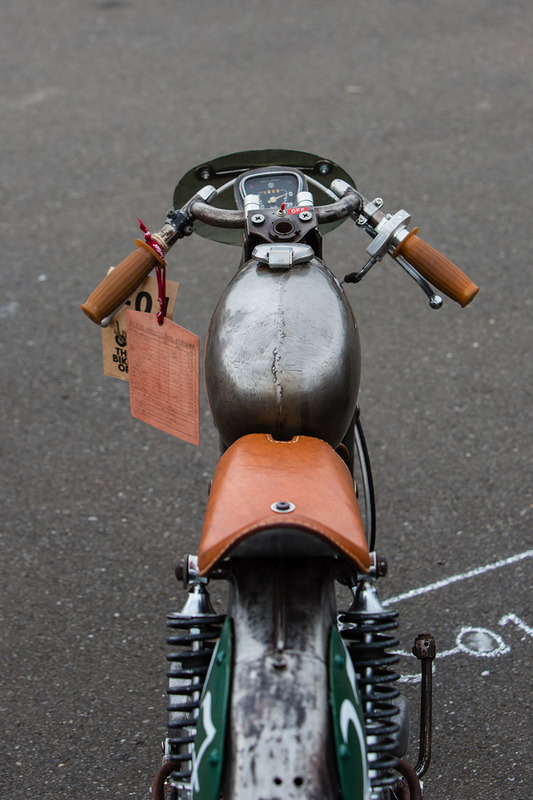 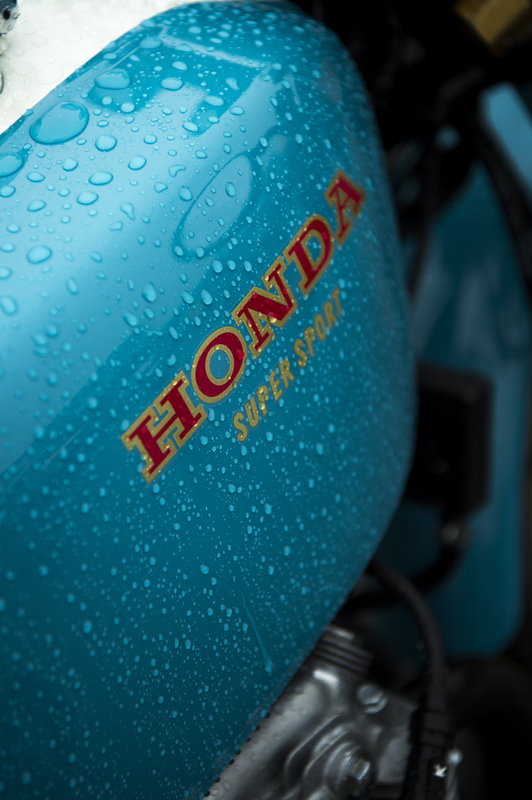 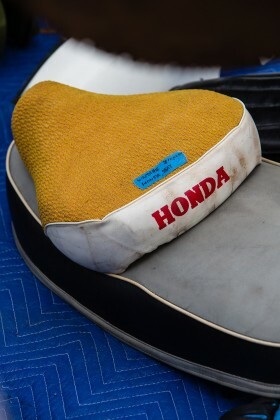 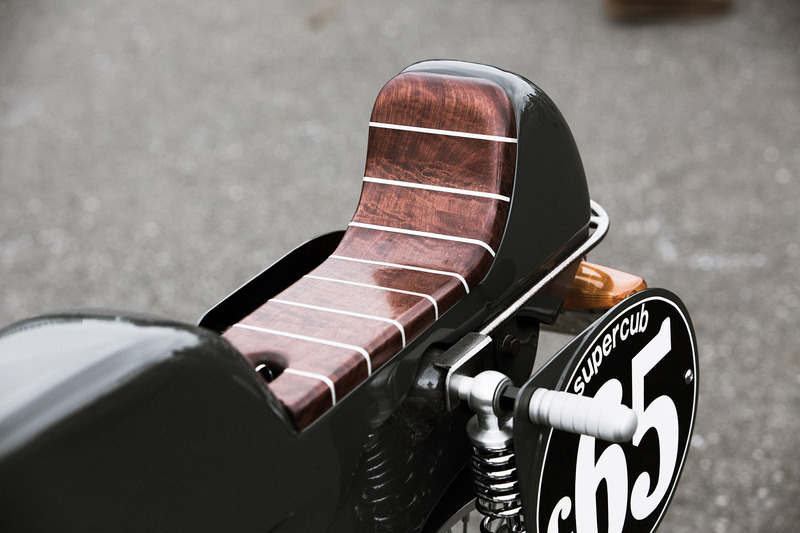 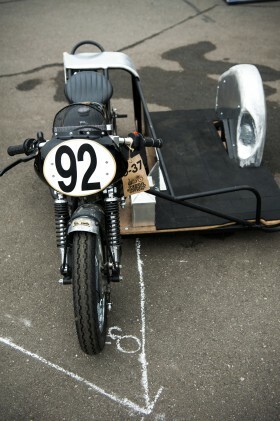 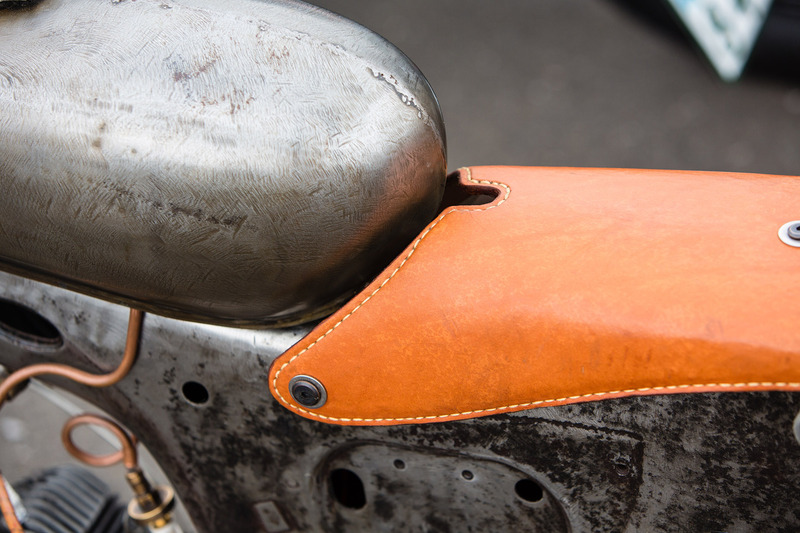 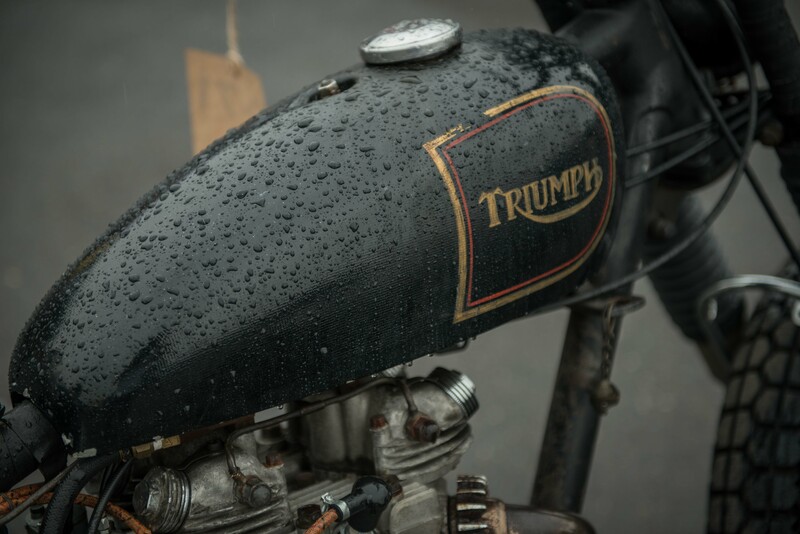 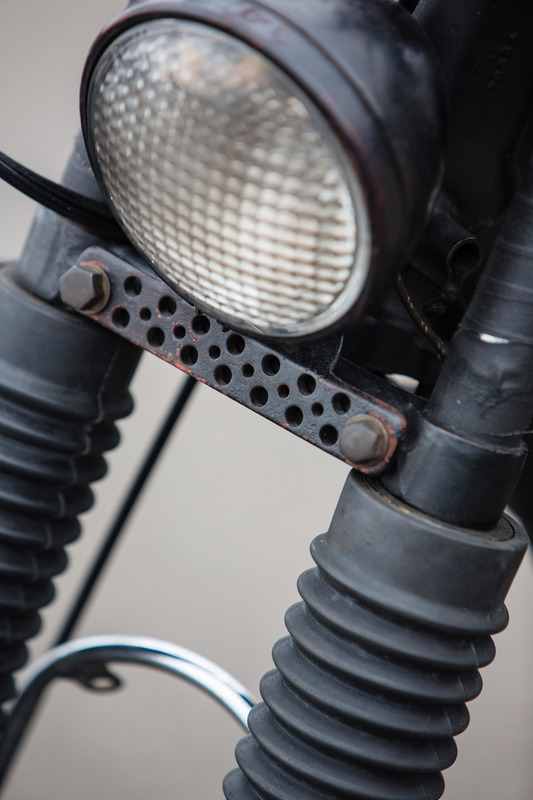 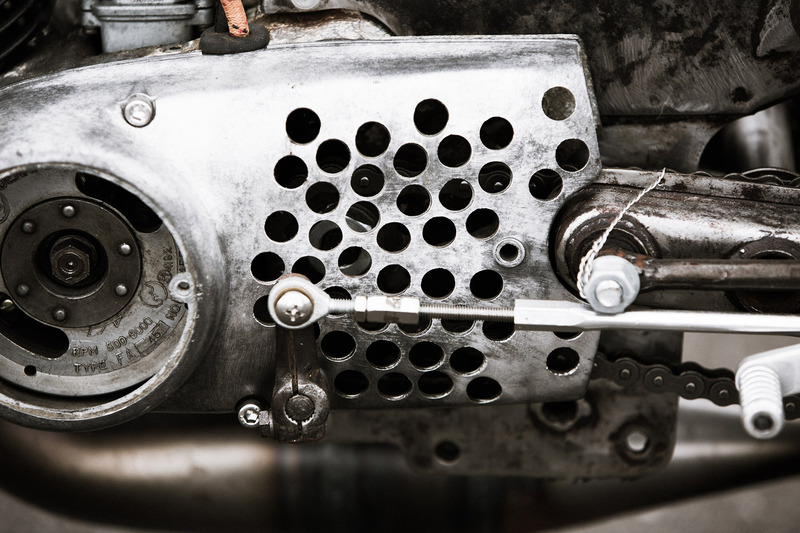 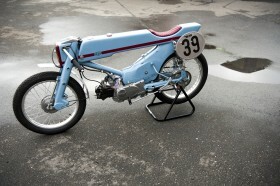 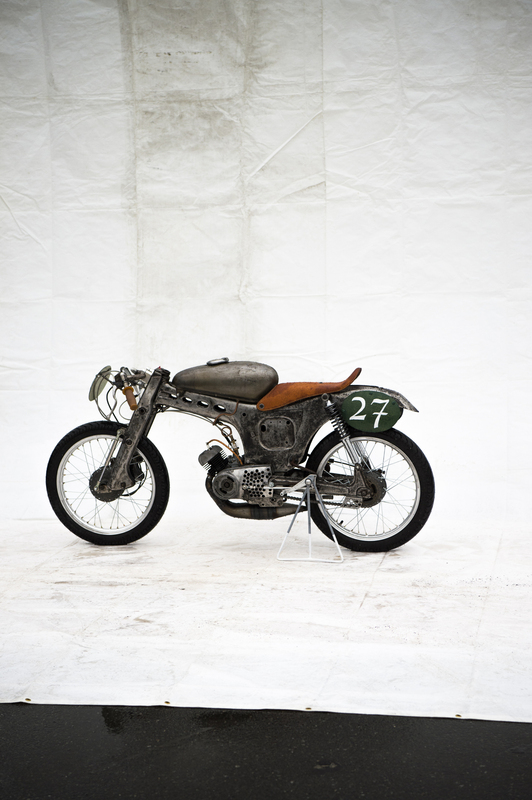 From 1950’s inspired 49cc vintage front mount iron, to experimental monocoque steel and plexiglass steeds, to one-off purpose built board track framers – the offerings on display were anything but conventional. 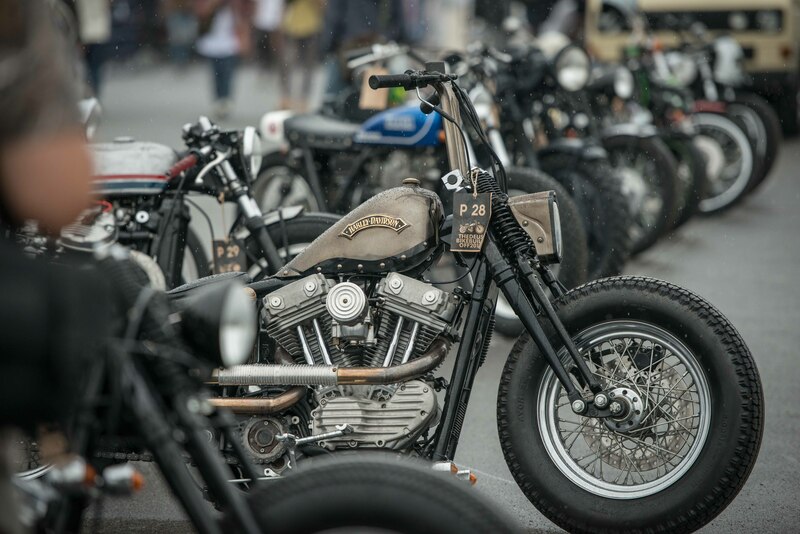 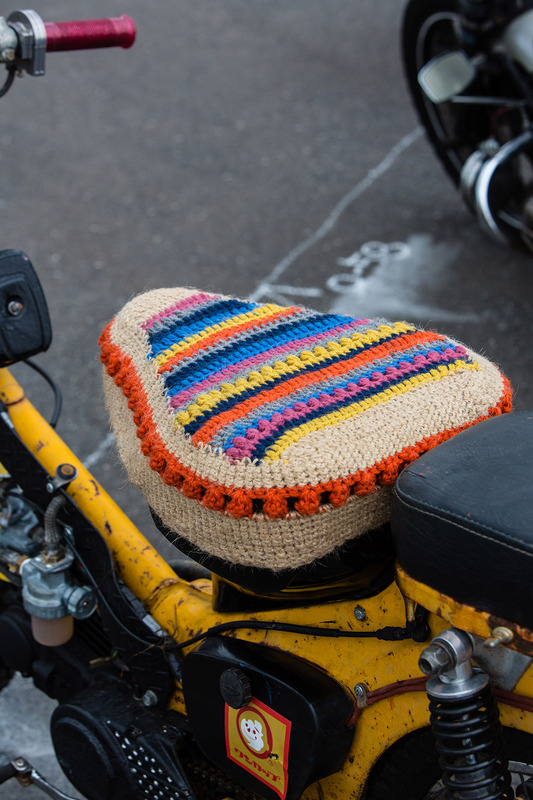 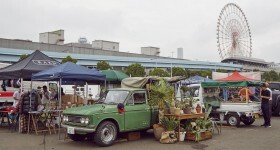 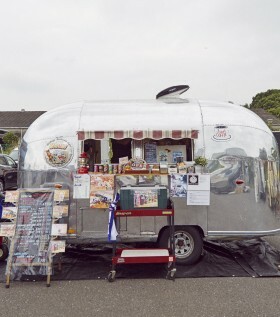 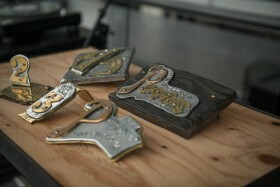 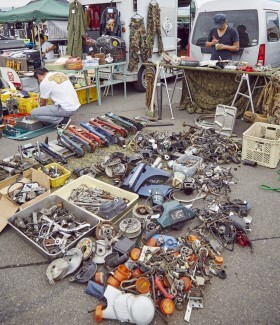 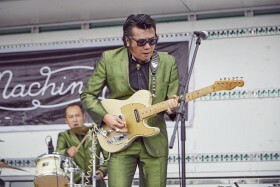 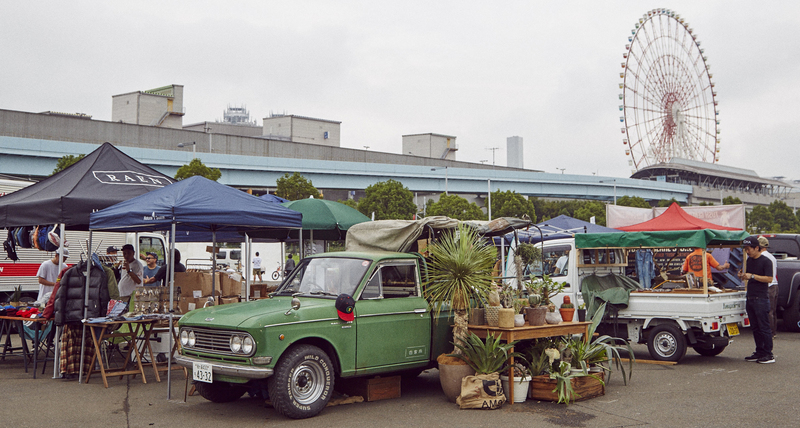 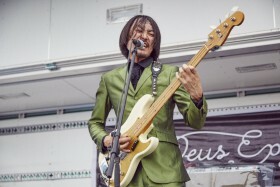 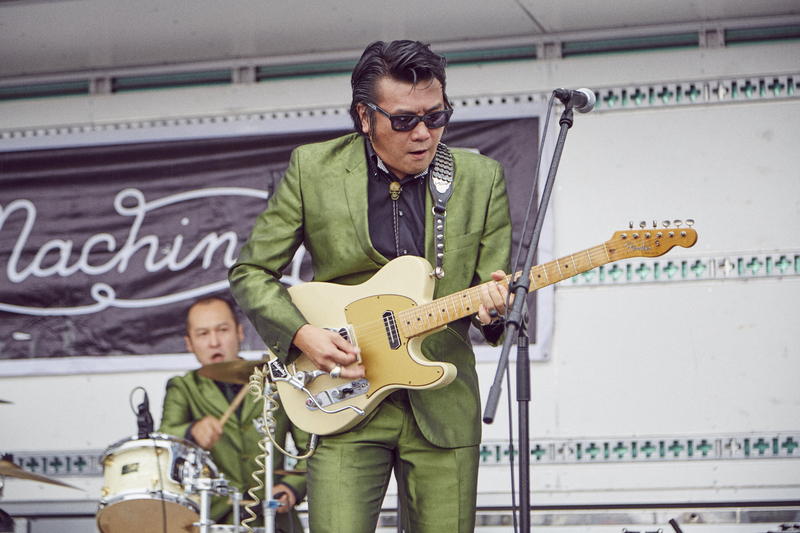 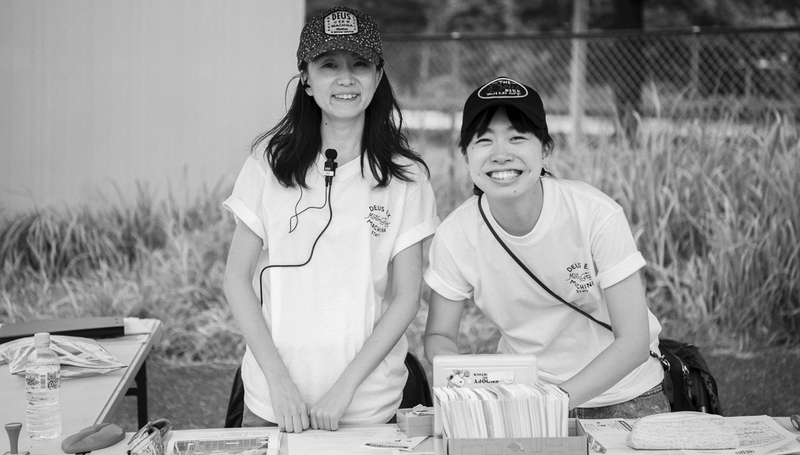 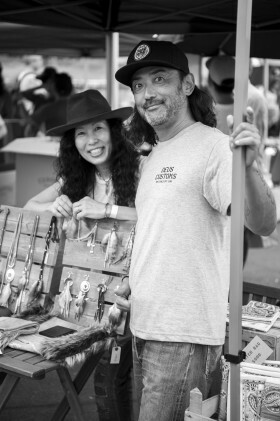 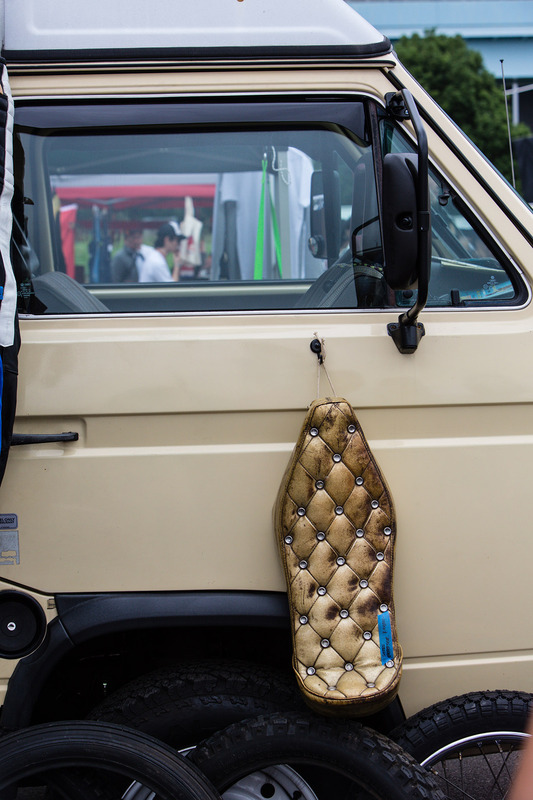 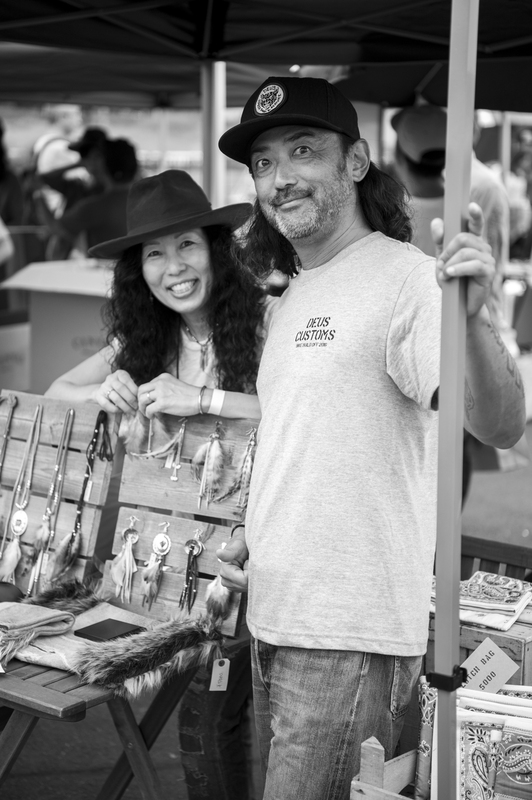 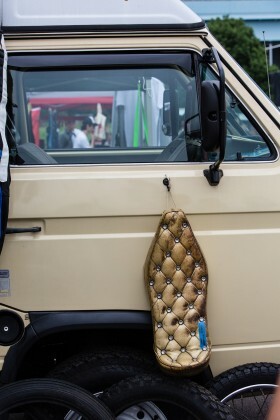 As the 1500 strong crowd drank in the sea of creativity before them, stamina’s fortified by pulled pork sandwiches, coffee and craft beer, the lucky ones scoured the swap meet offerings and snagged trophies of their own. 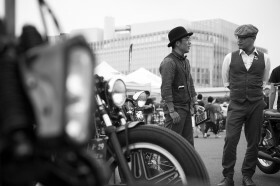 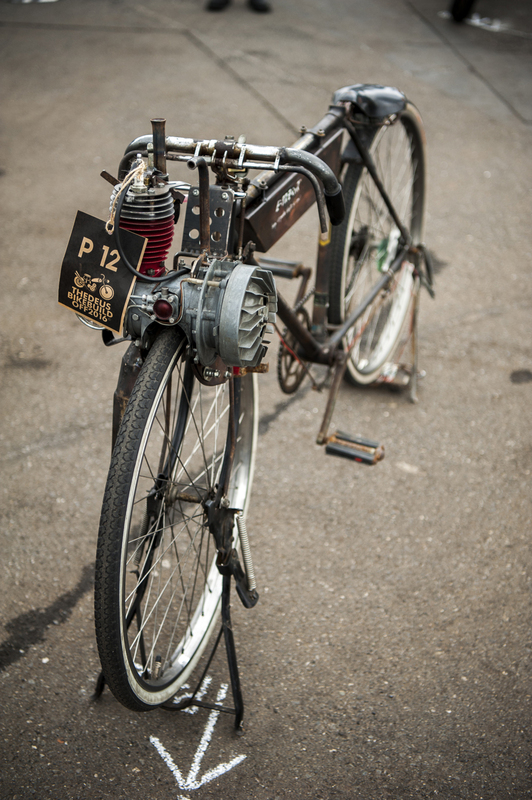 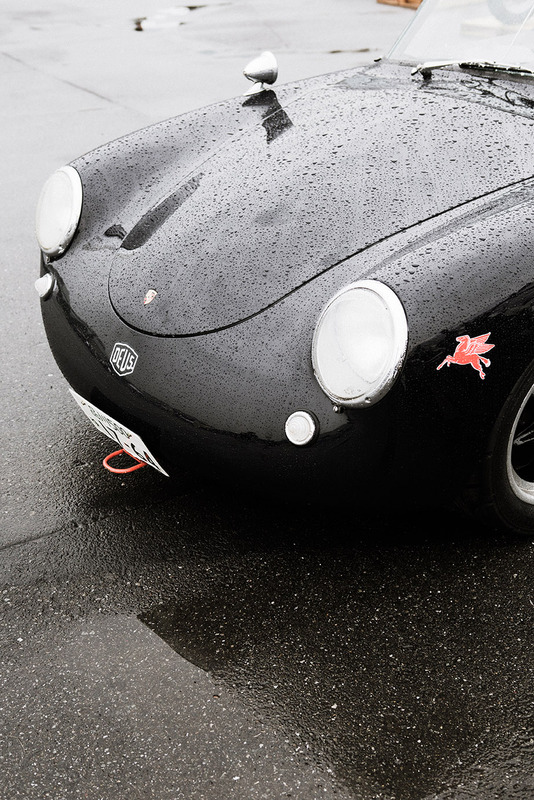 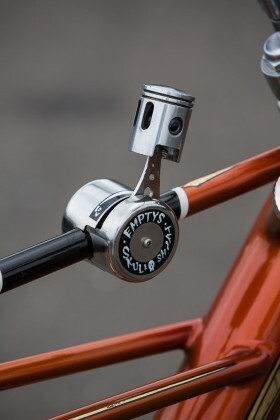 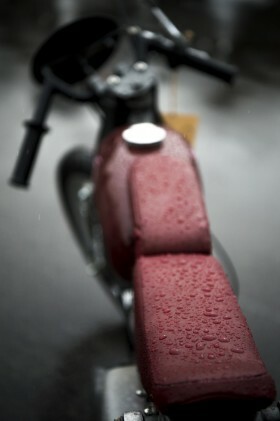 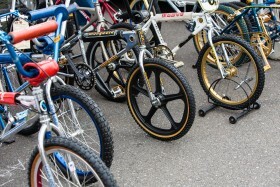 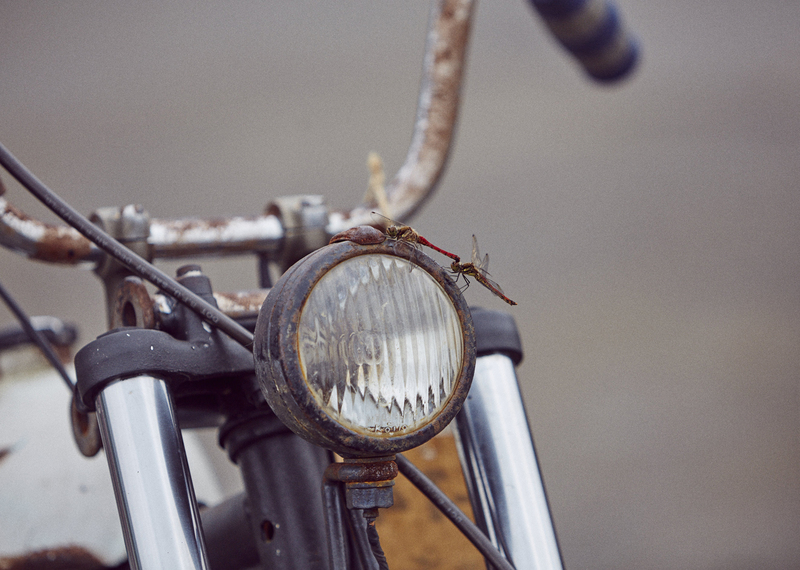 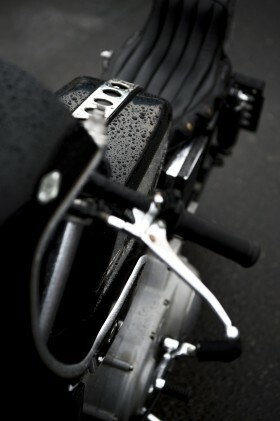 Their eyes glazed over with visions of future grandeur and hands cradled vintage guards, wheels or lights as if gold. While the growing storm clouds saw fit to attempt to bring our celebrations to an early and damp finish, the band played on as the panel of judges compared notes to select three of the eligible hoard on offer to crown as triumphant. But that is a story for the coming days. 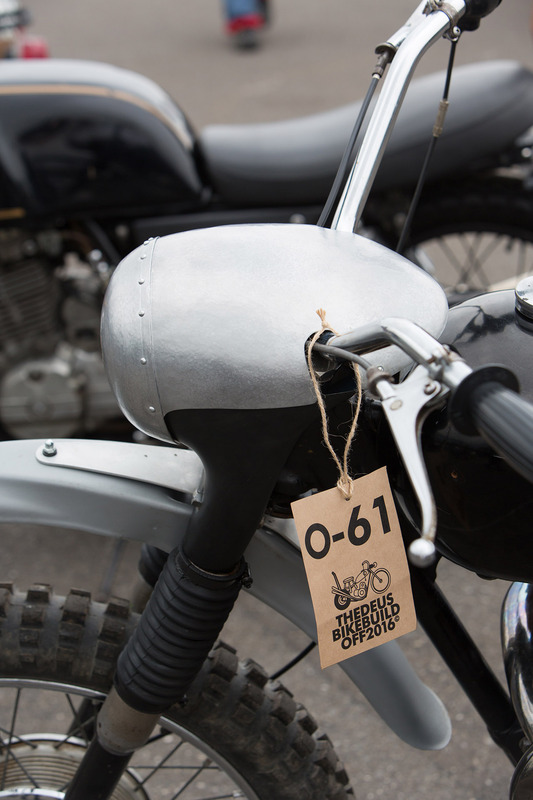 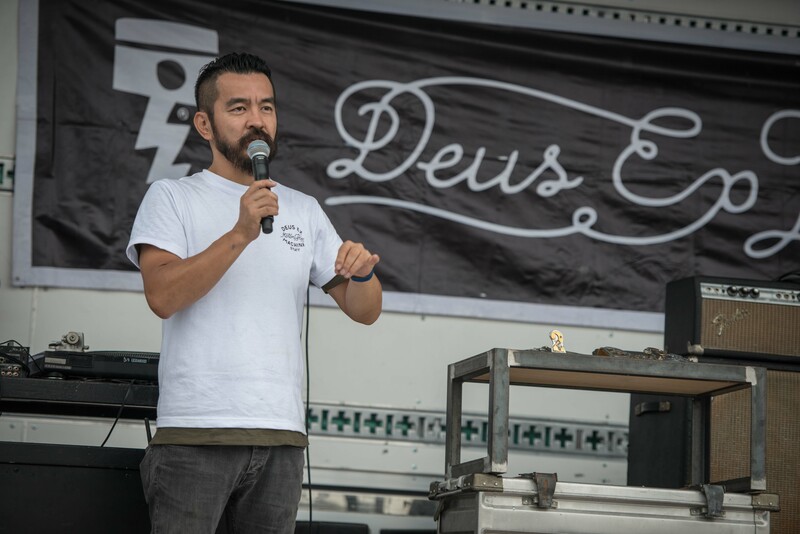 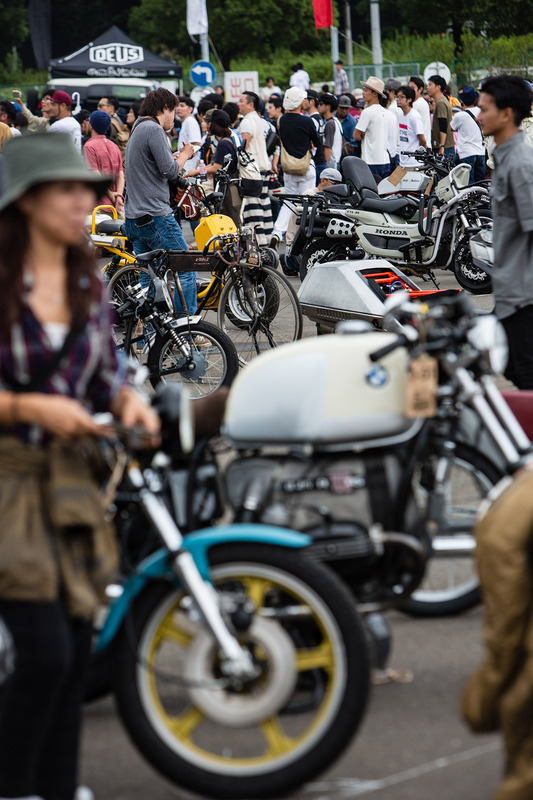 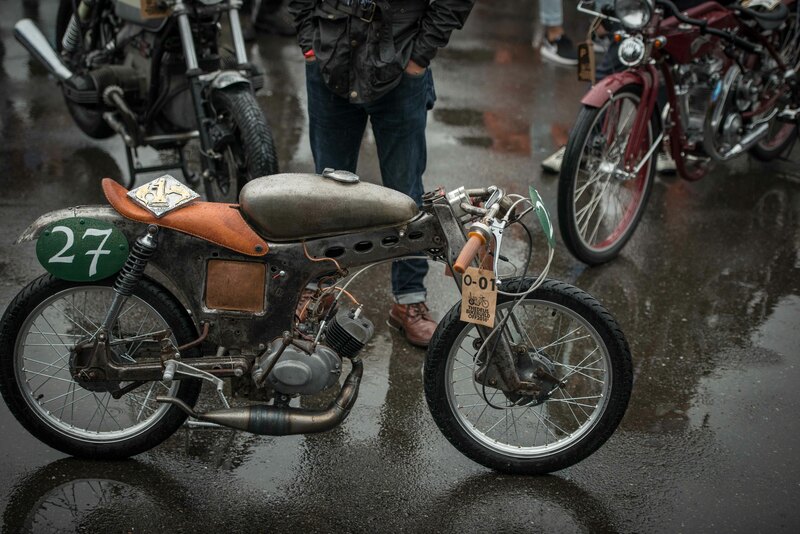 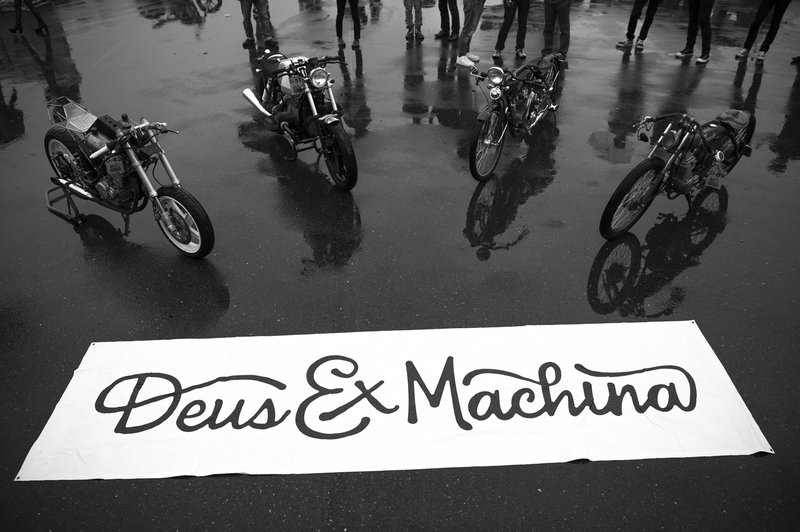 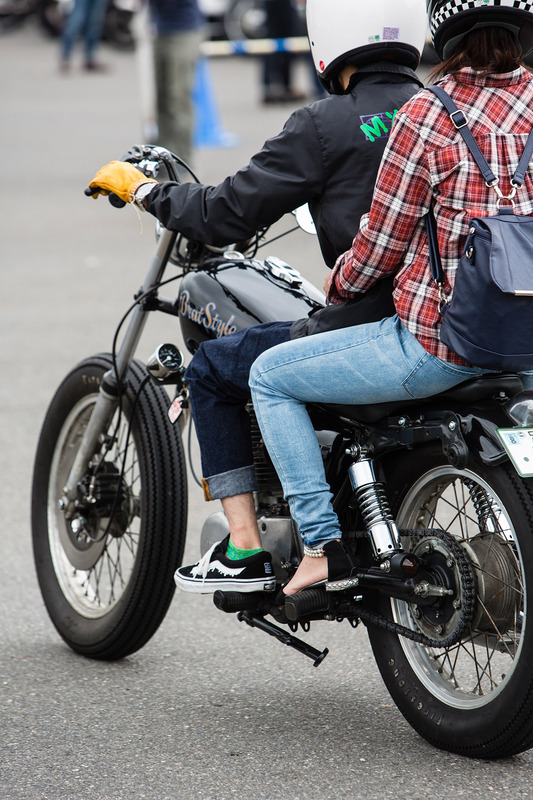 To the moto faithful who lifted two fingers in defiance of the weather plus the scores of bruised knuckled souls who deemed us worthy to view their incredible creations in the flesh, we thank you for fuelling our passion and making the 2016 Deus Bike Build Off a blast.